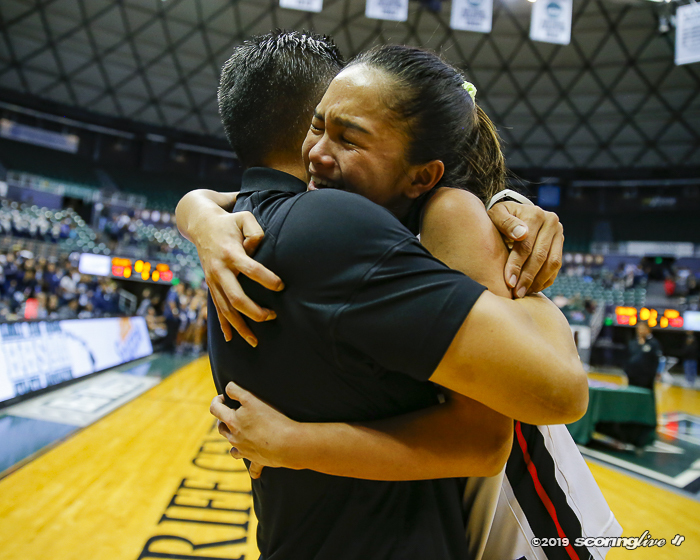 MANOA — Elation and devastation. 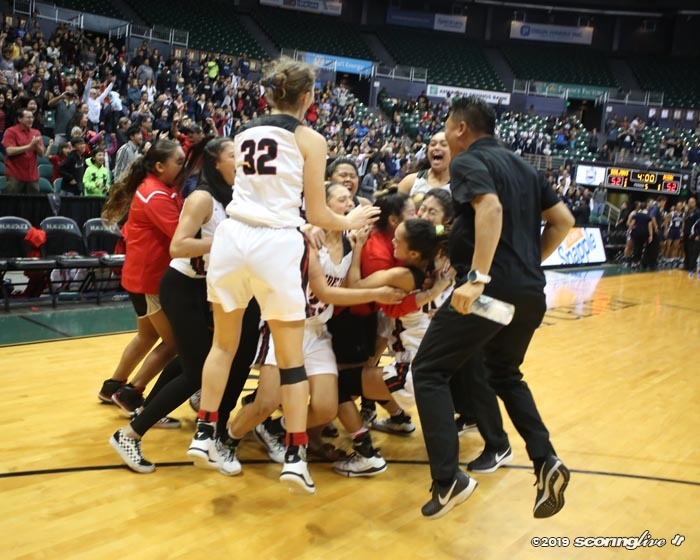 Two teams jumping for joy for a minute, but after several minutes of delay, a winner emerged. 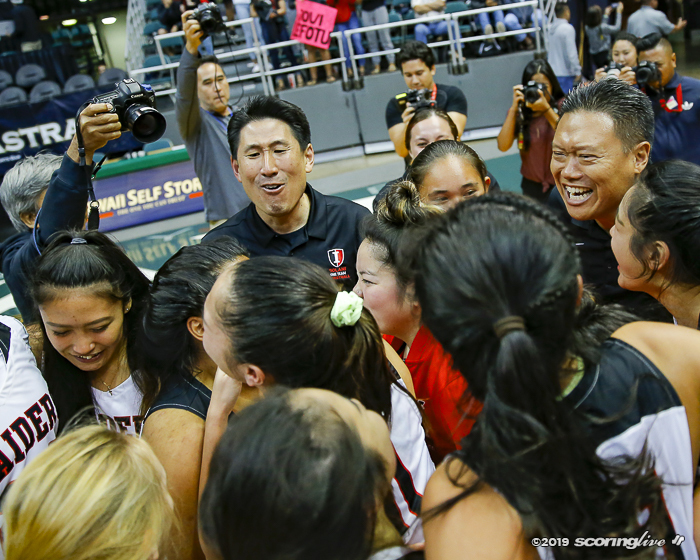 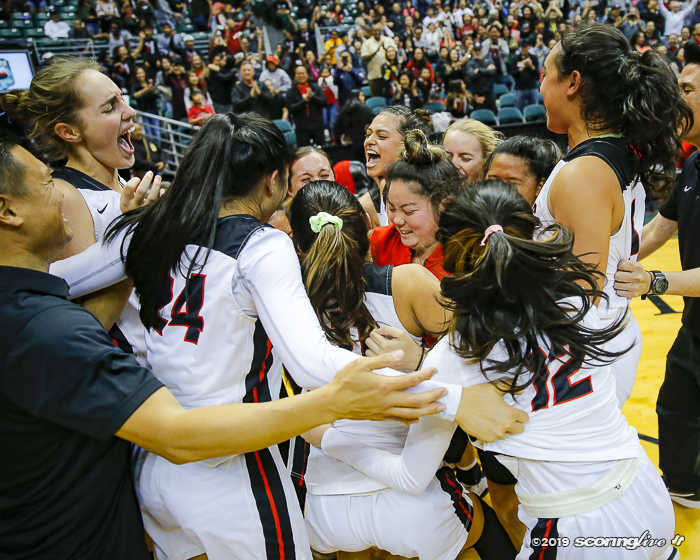 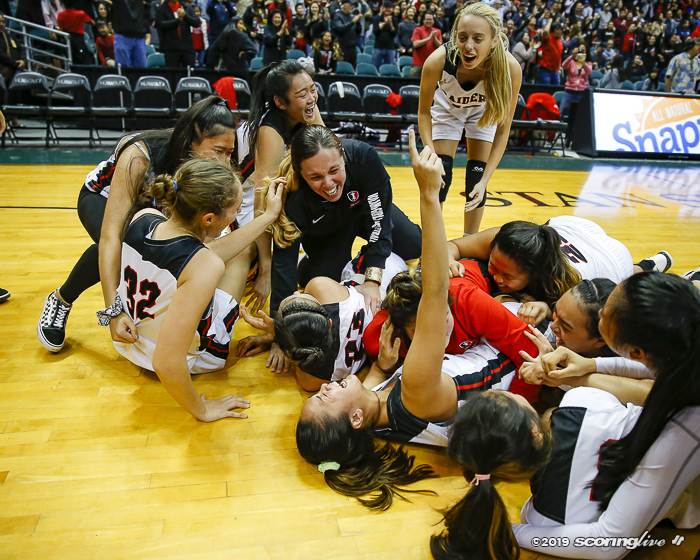 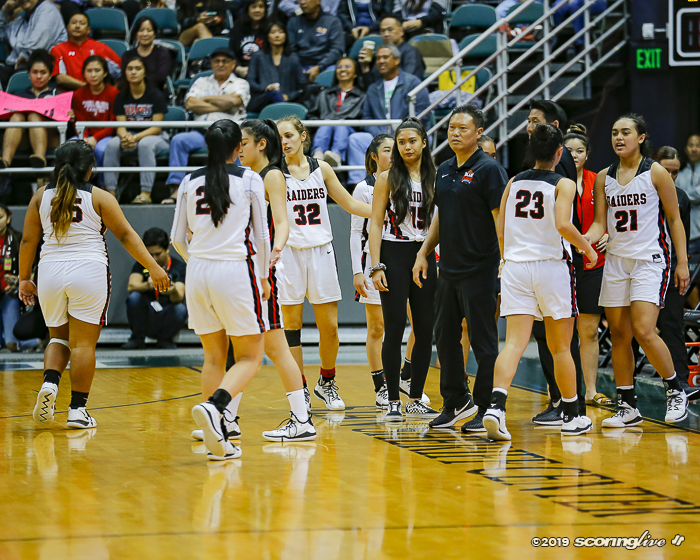 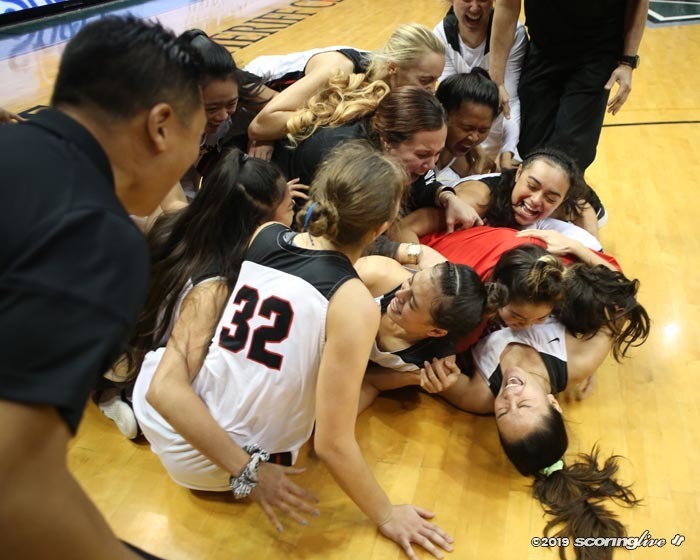 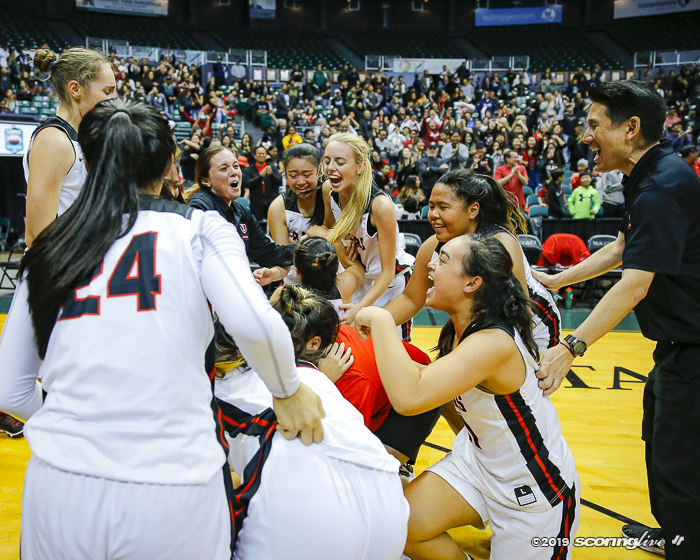 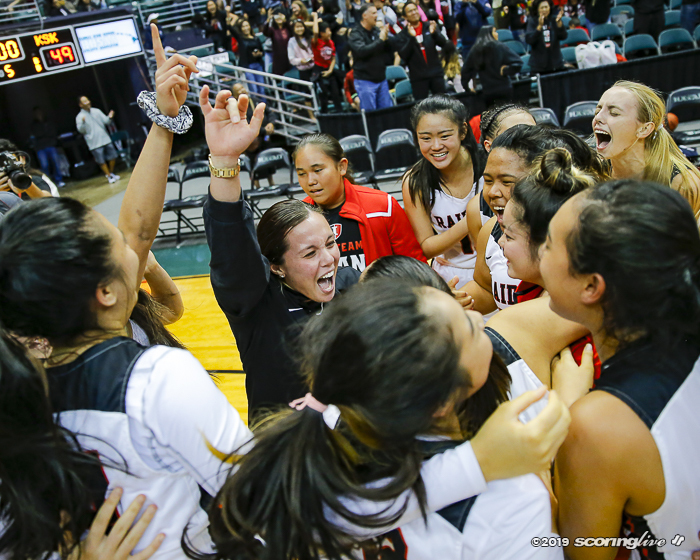 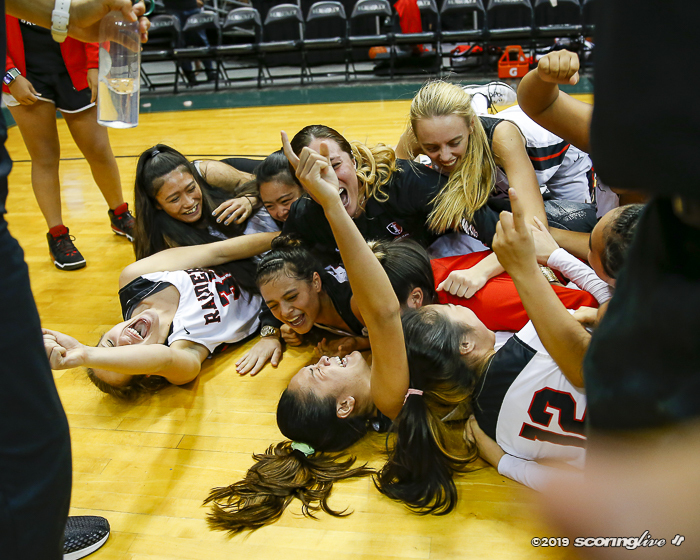 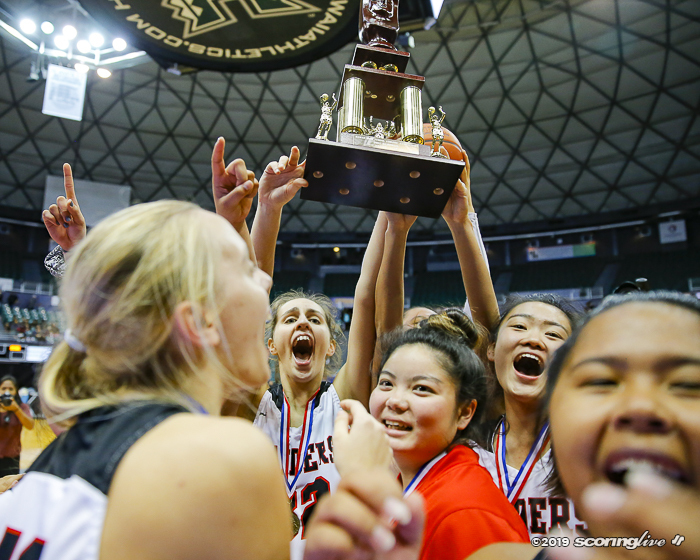 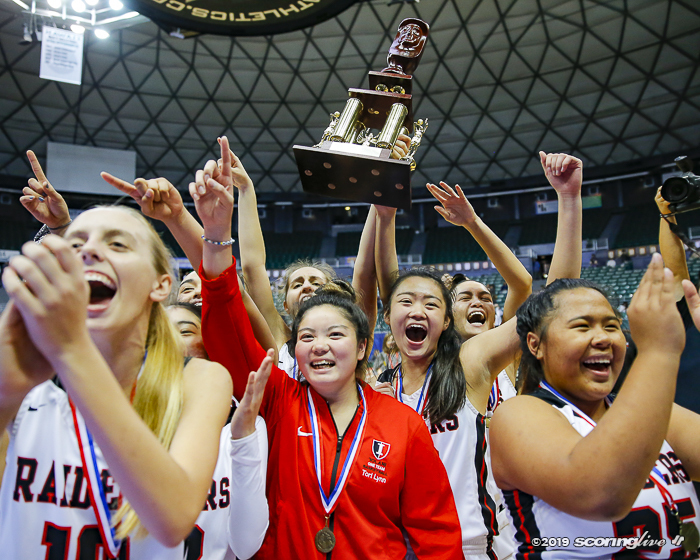 Top-ranked and top-seeded Iolani survived by a millisecond in holding off No. 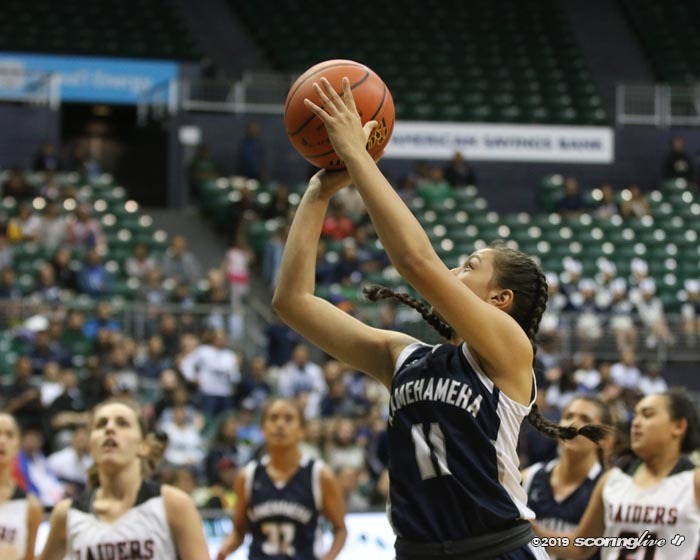 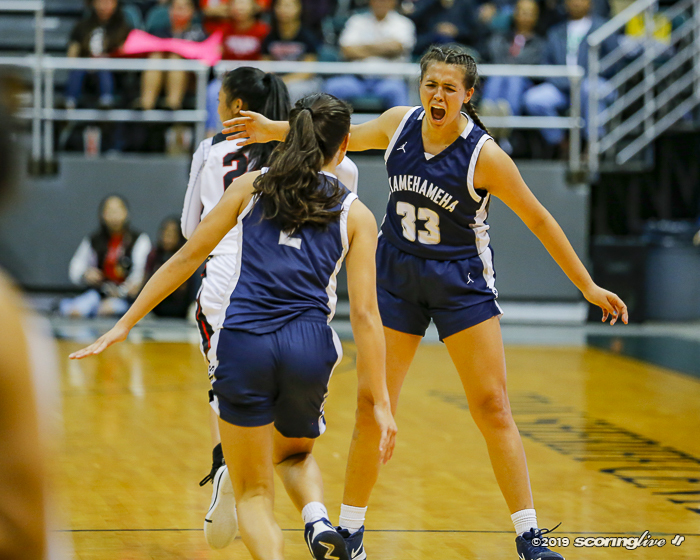 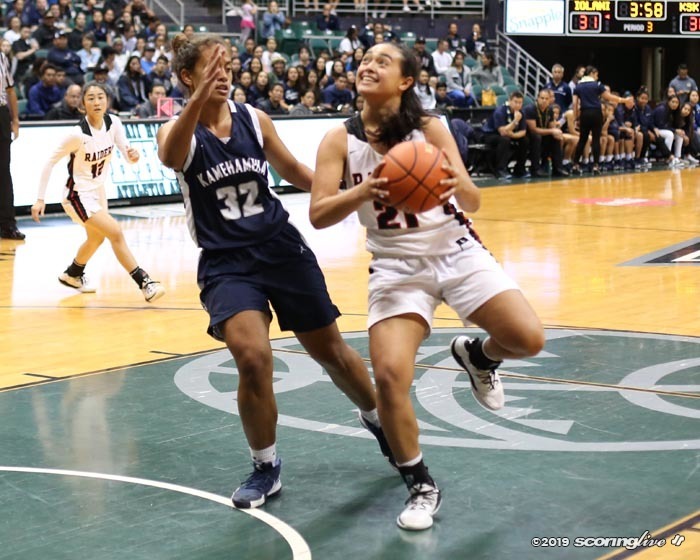 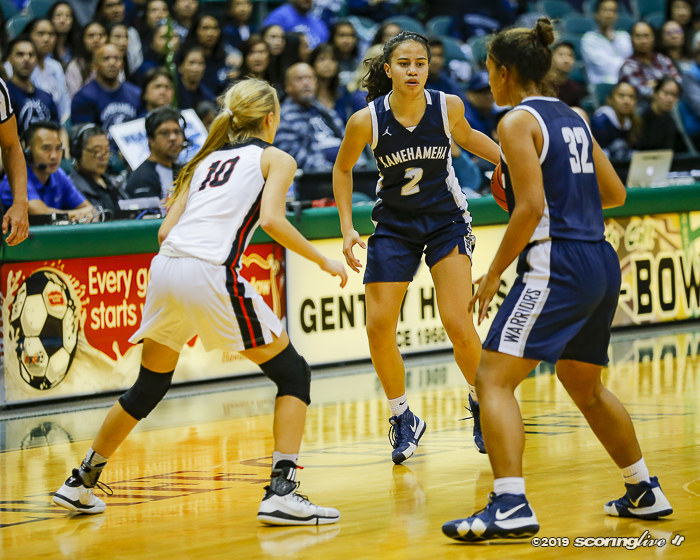 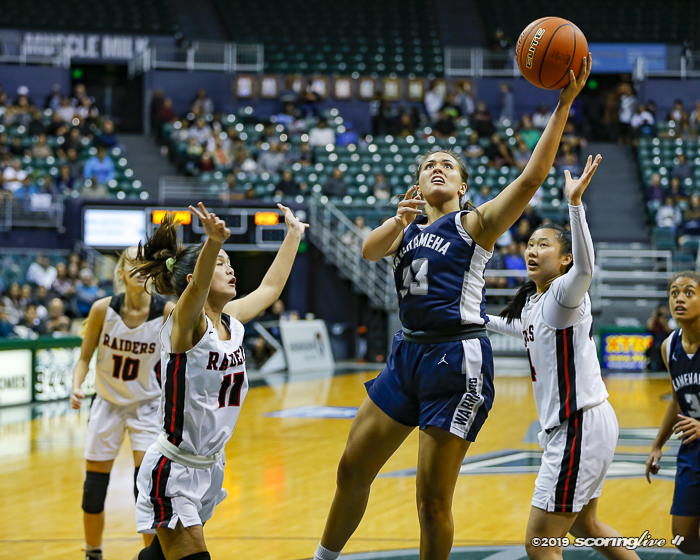 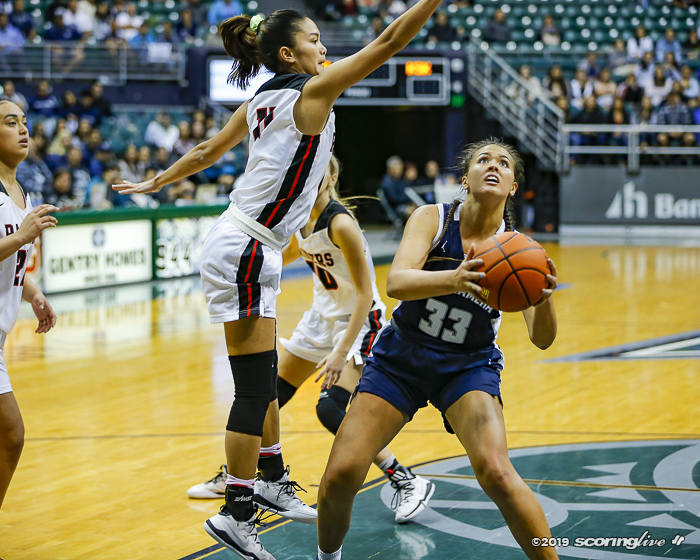 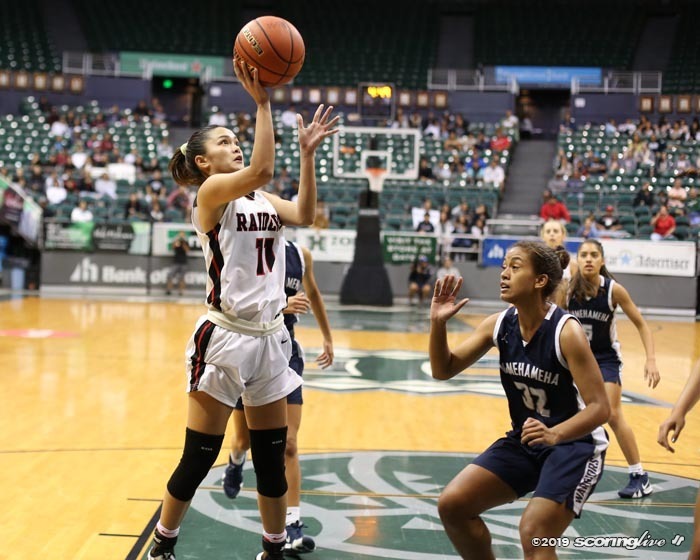 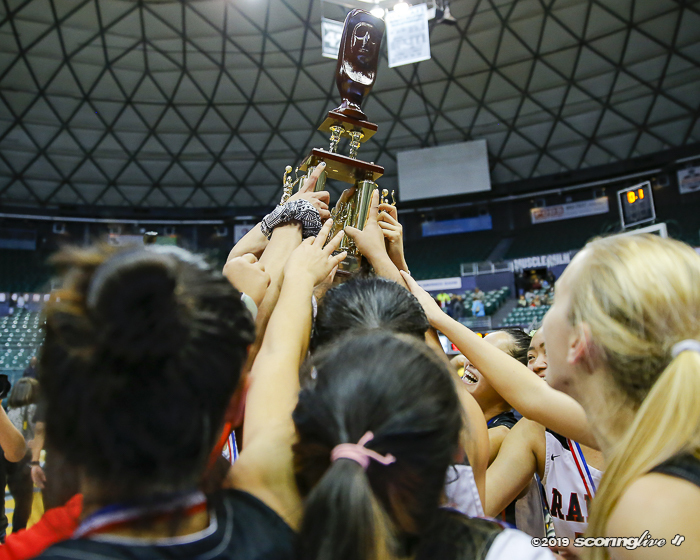 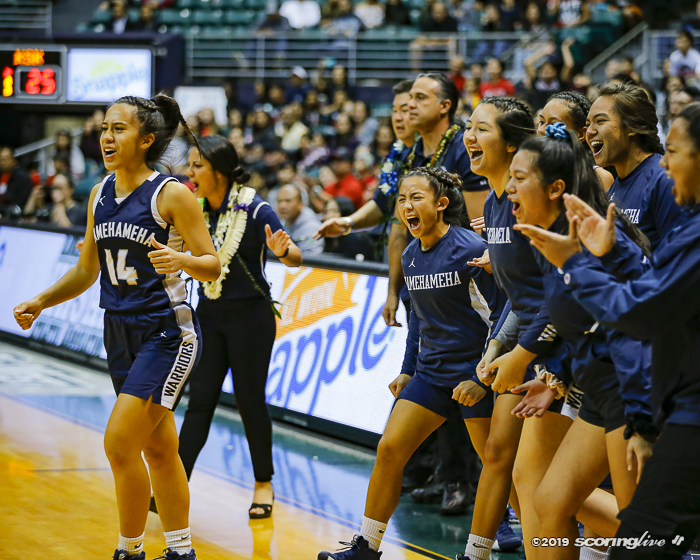 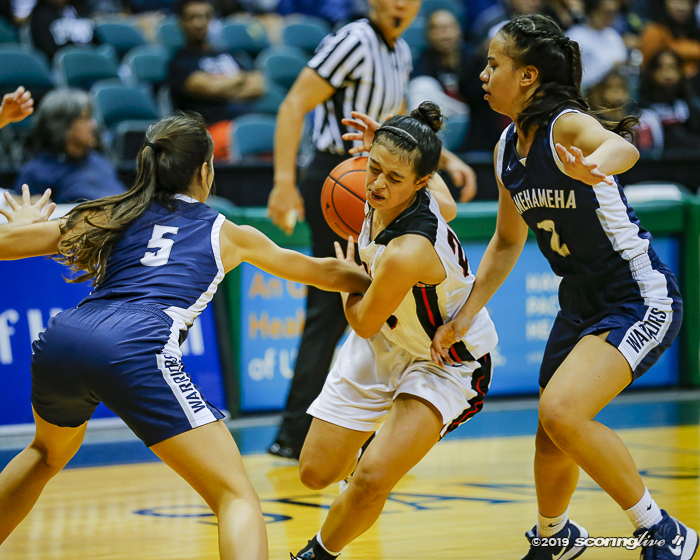 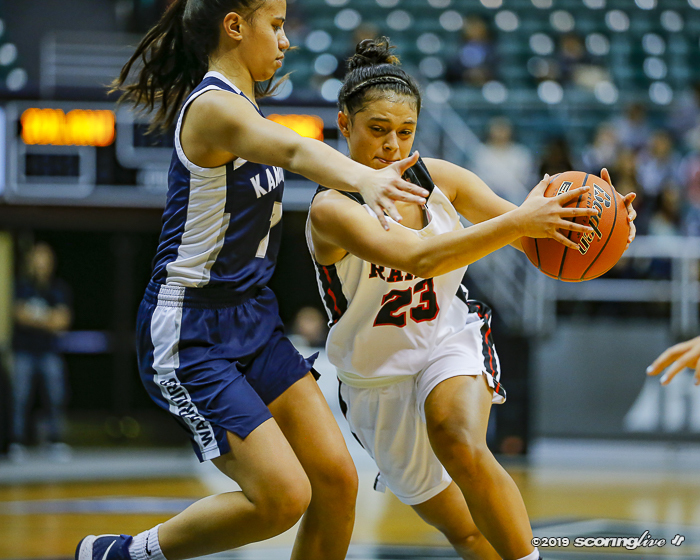 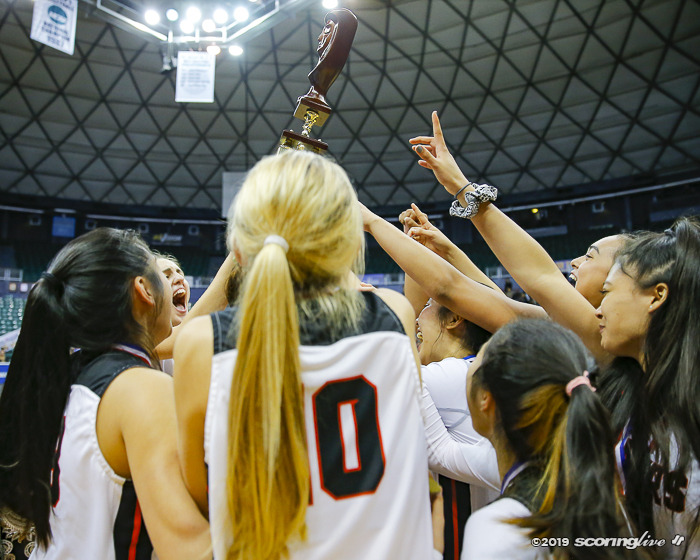 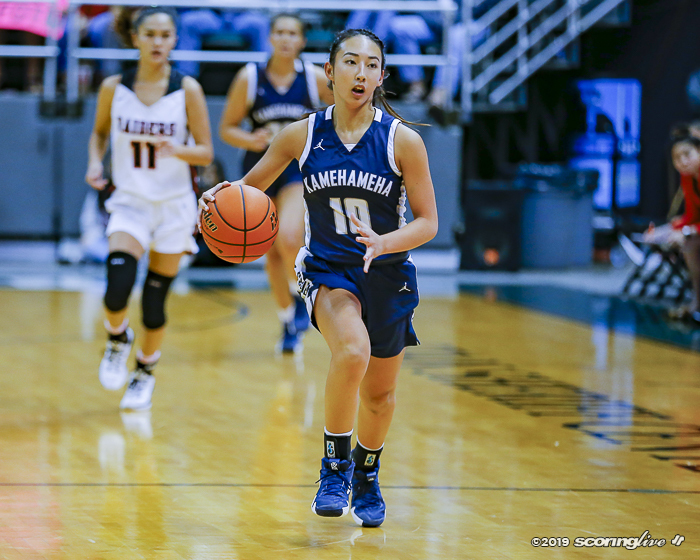 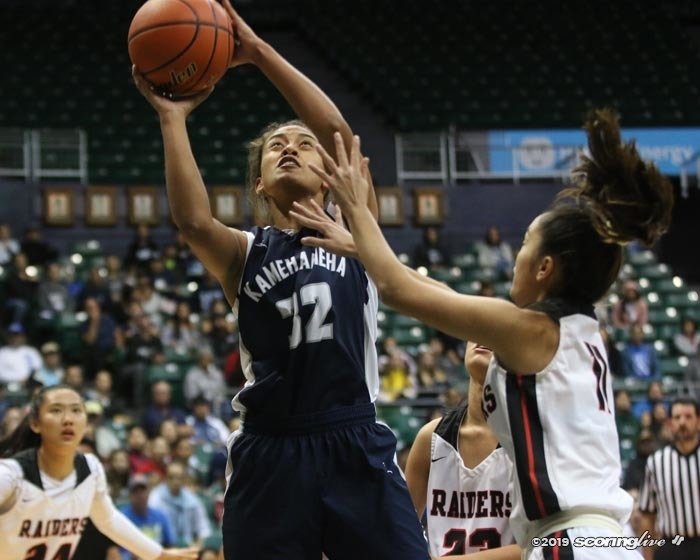 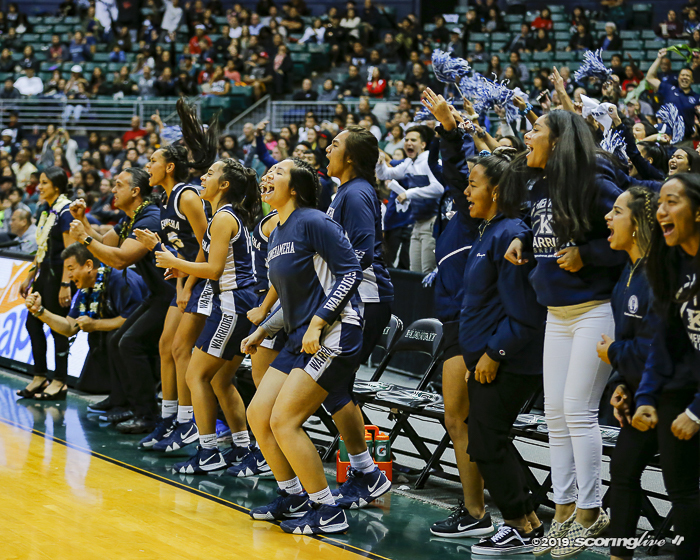 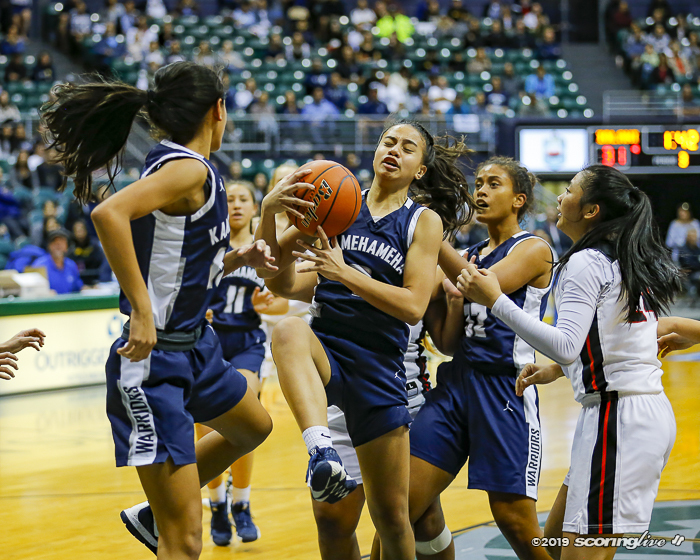 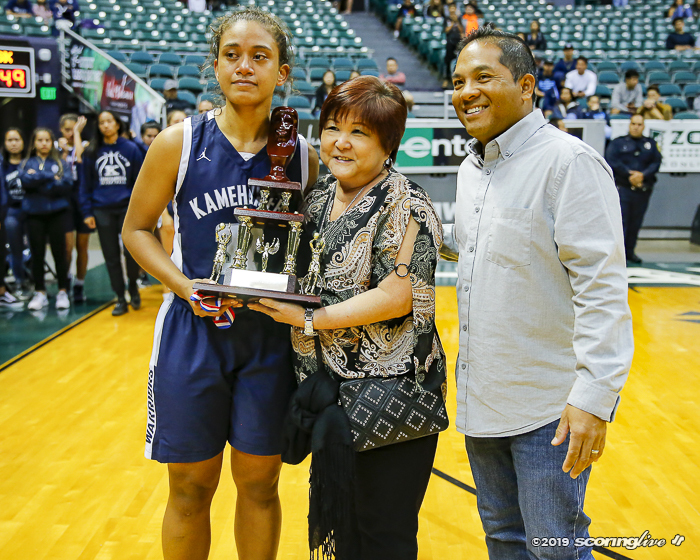 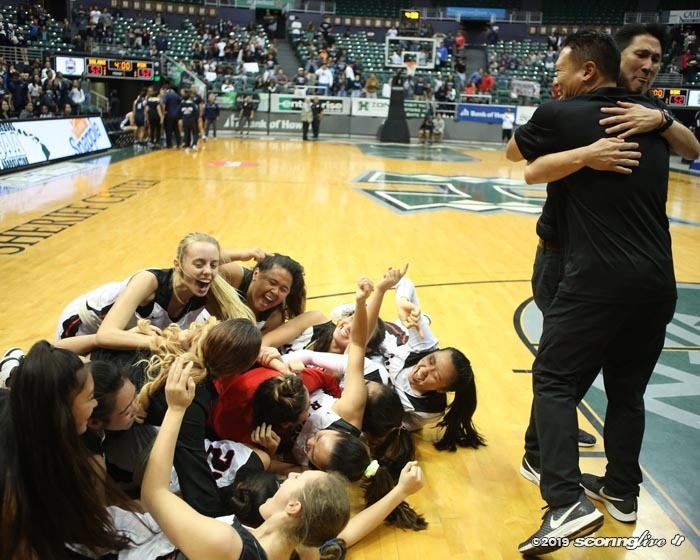 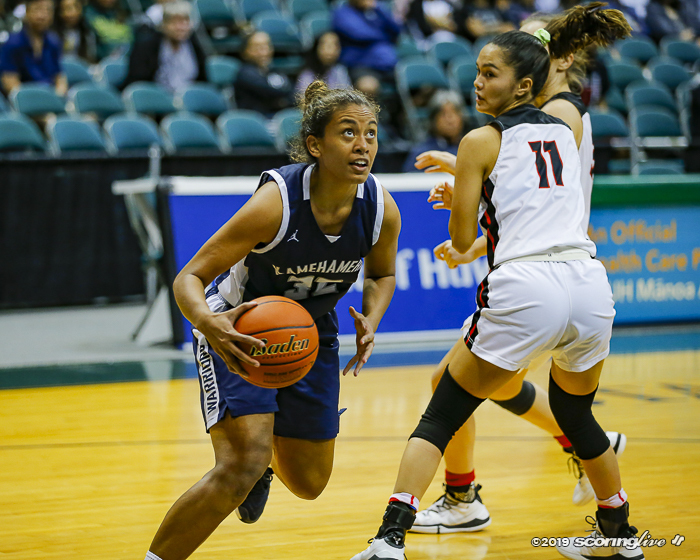 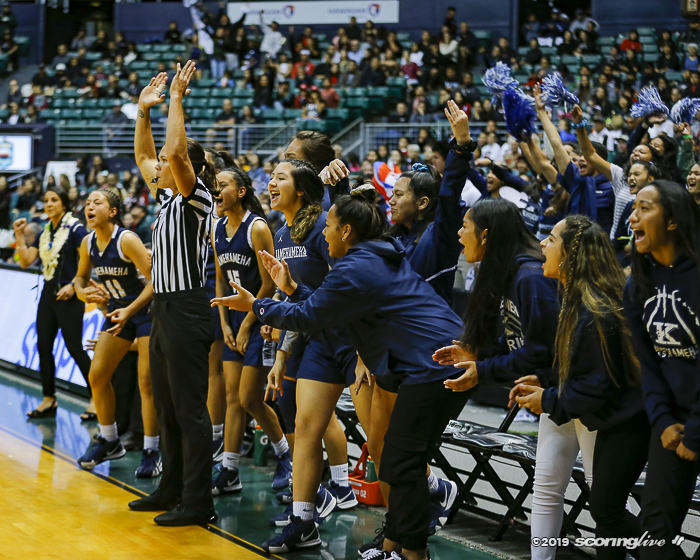 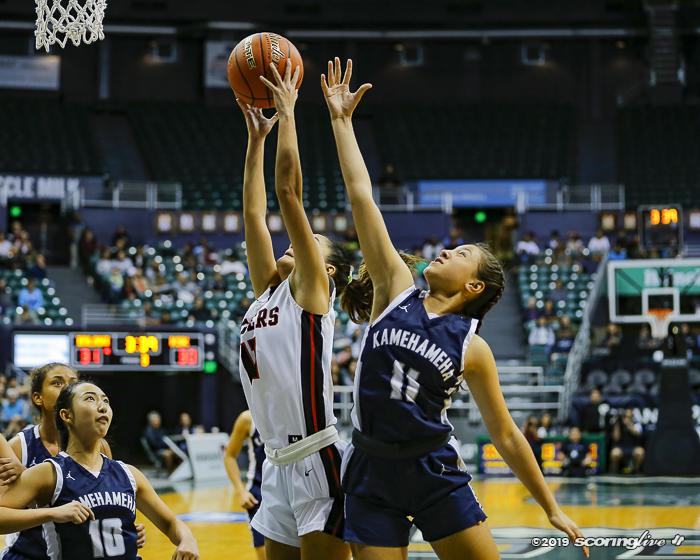 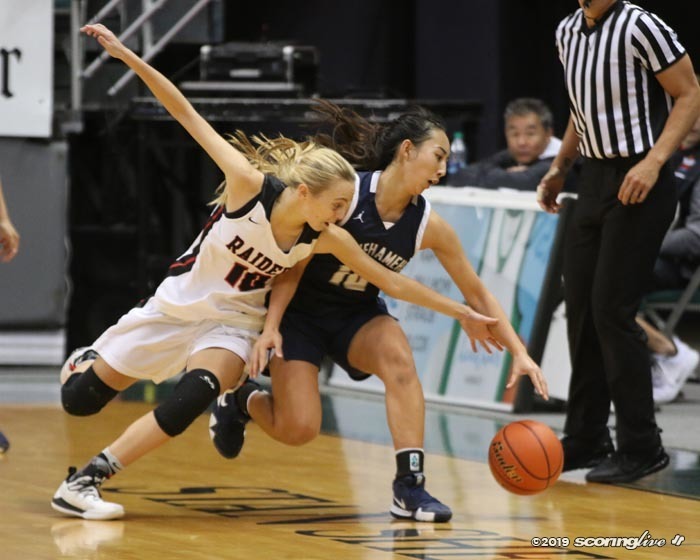 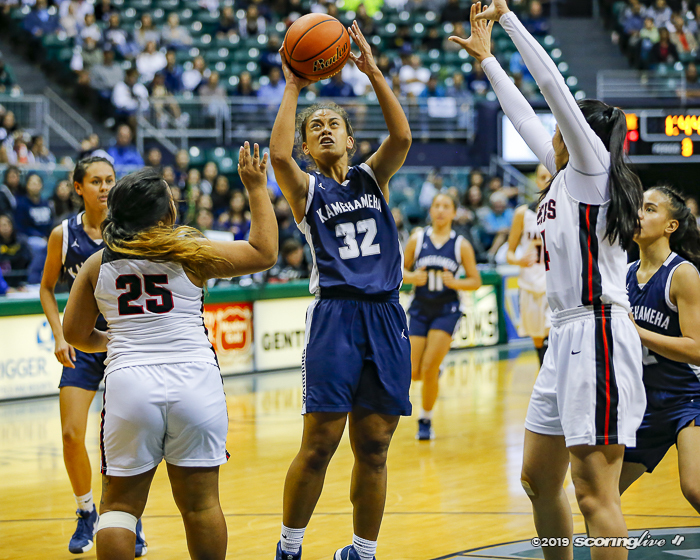 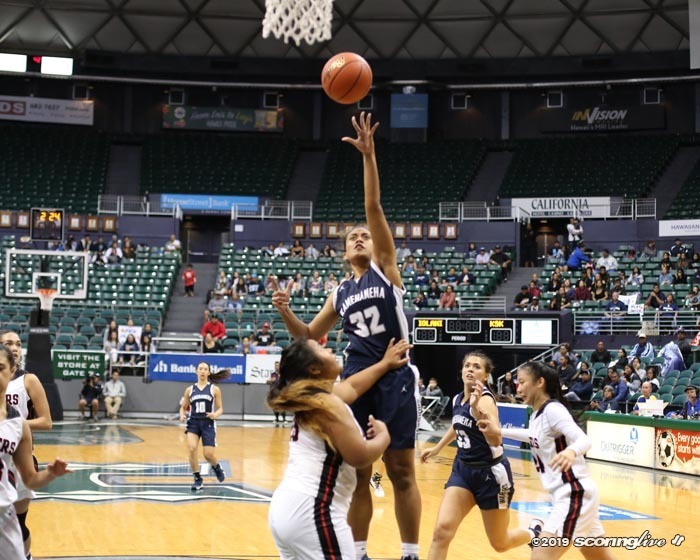 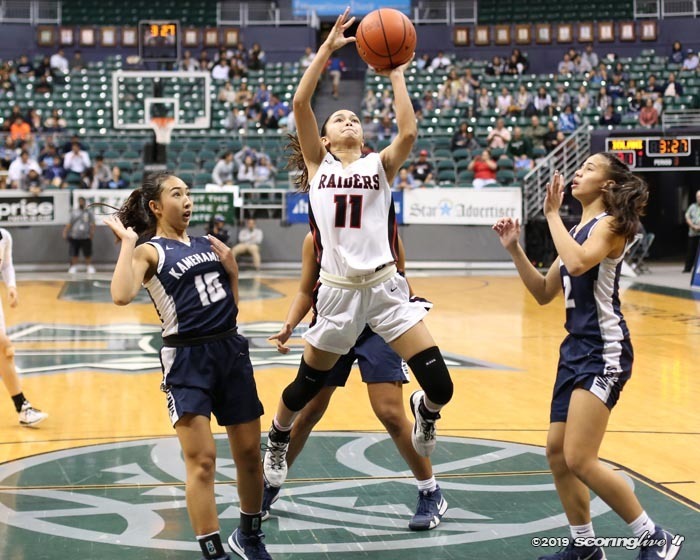 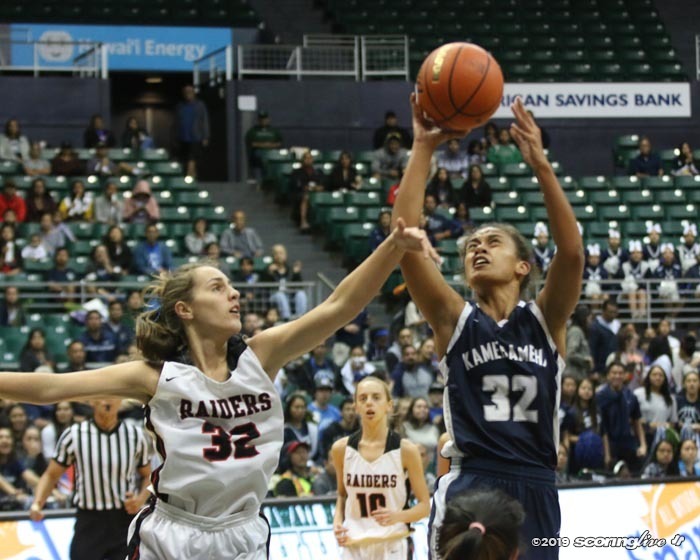 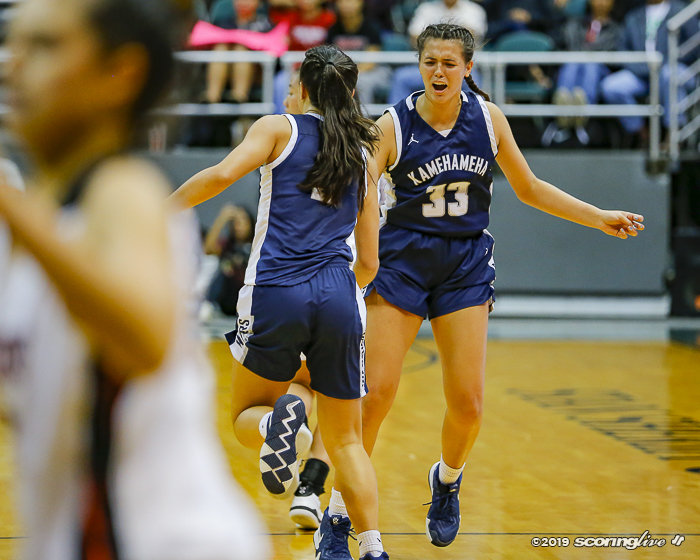 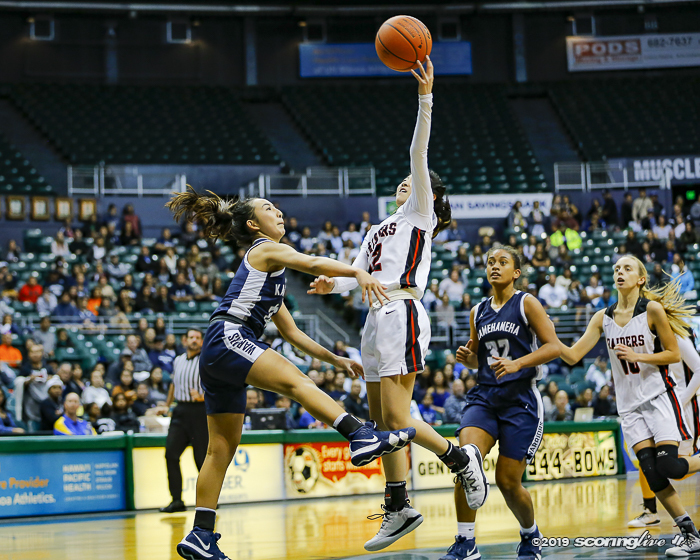 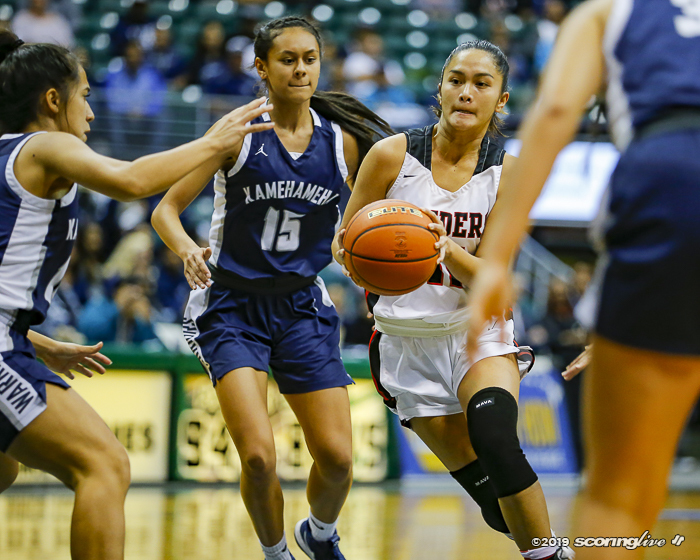 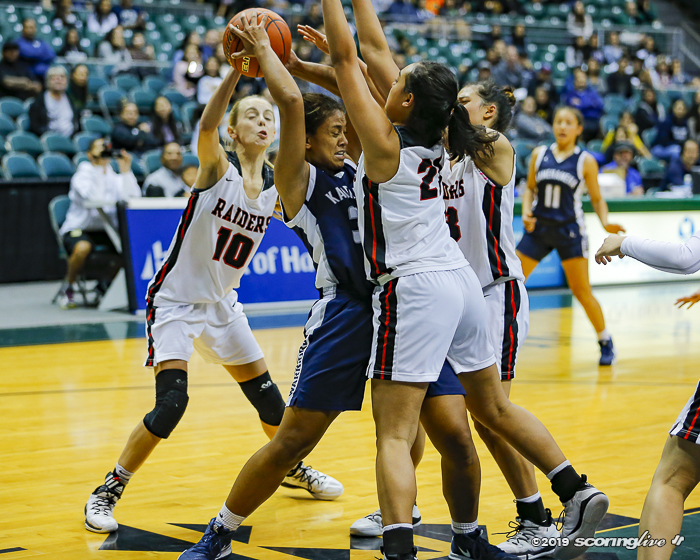 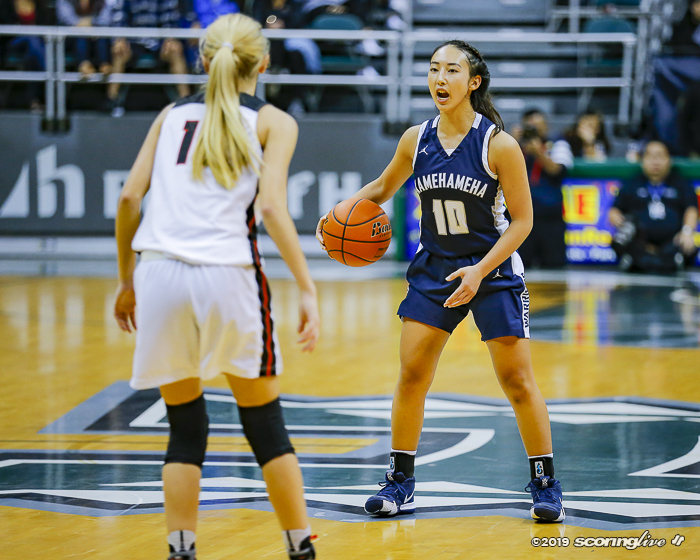 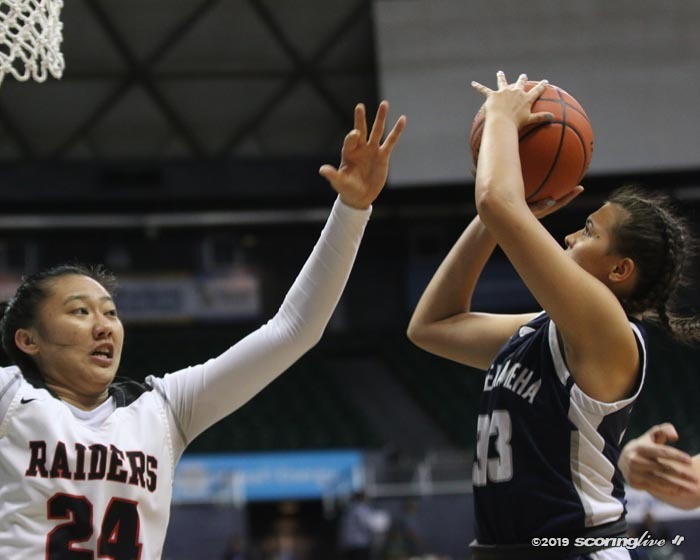 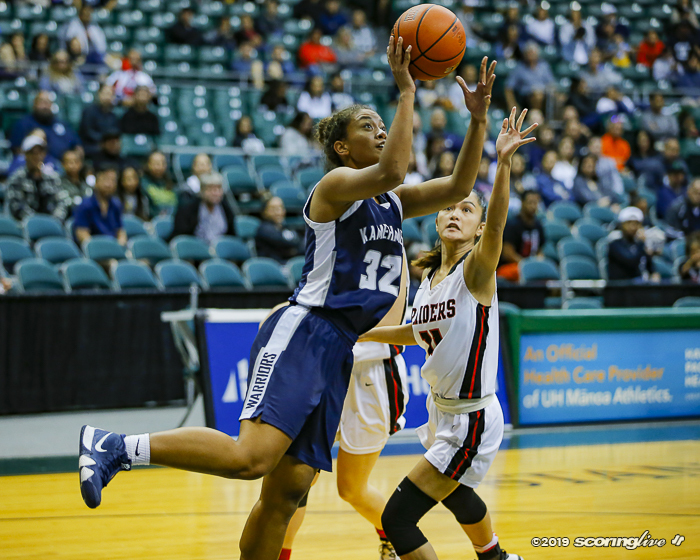 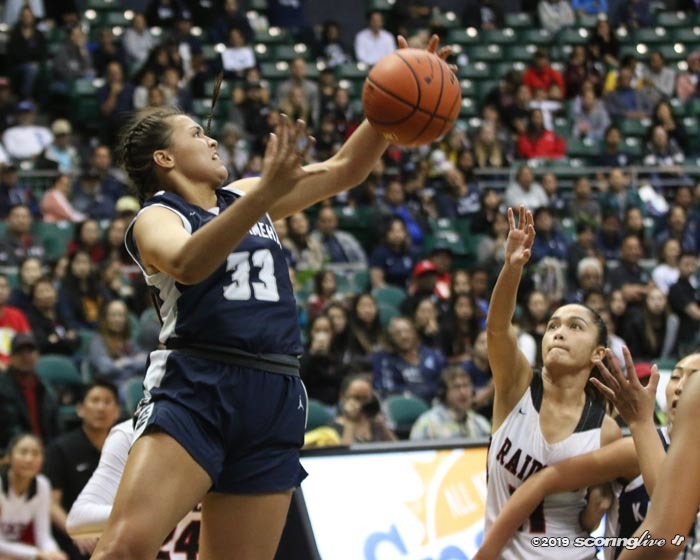 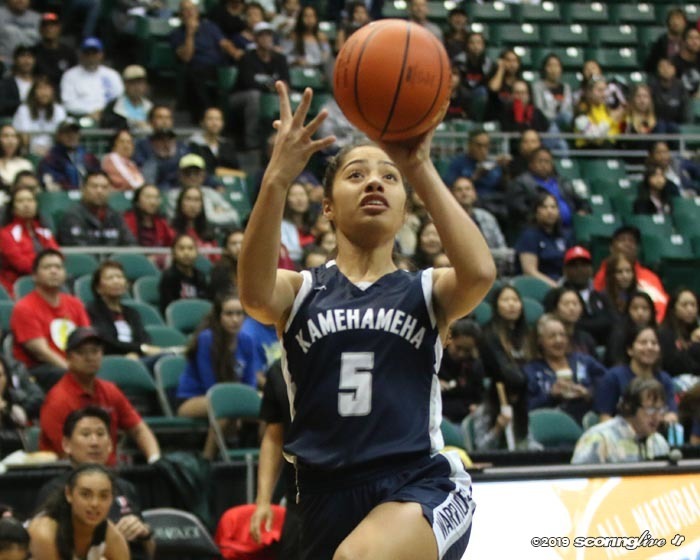 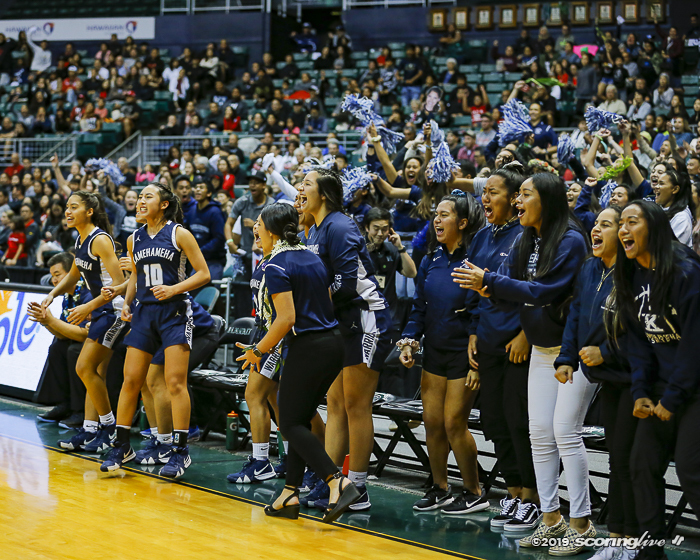 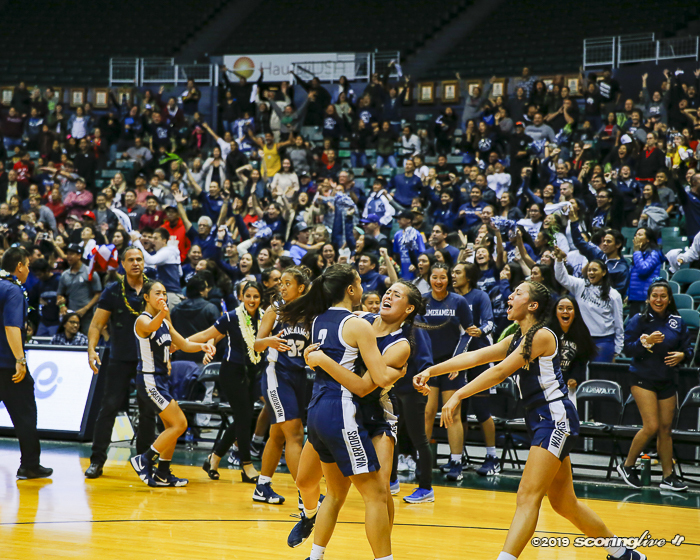 2 Kamehameha, 52-49, in a controversial and thrilling victory in the Snapple/HHSAA Division I Girls Basketball State Championship Saturday at the Stan Sheriff Center. 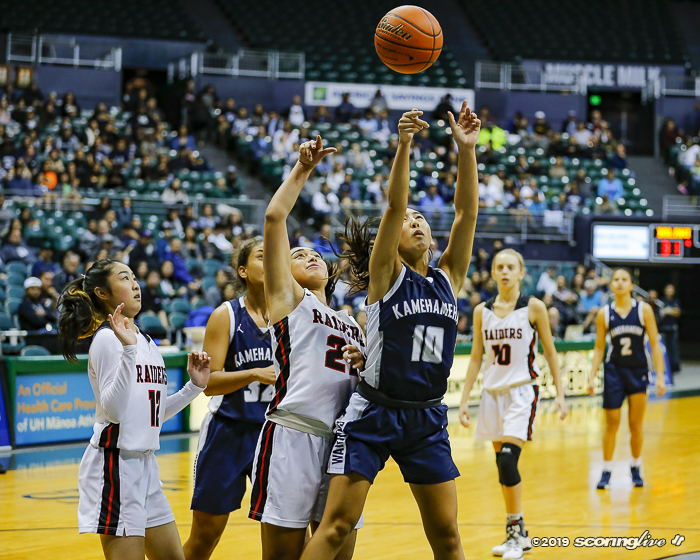 A 3-point buzzer shot by Kamehameha's Kalina Obrey for an apparent game-tying field goal was nullified after video review by the referees. 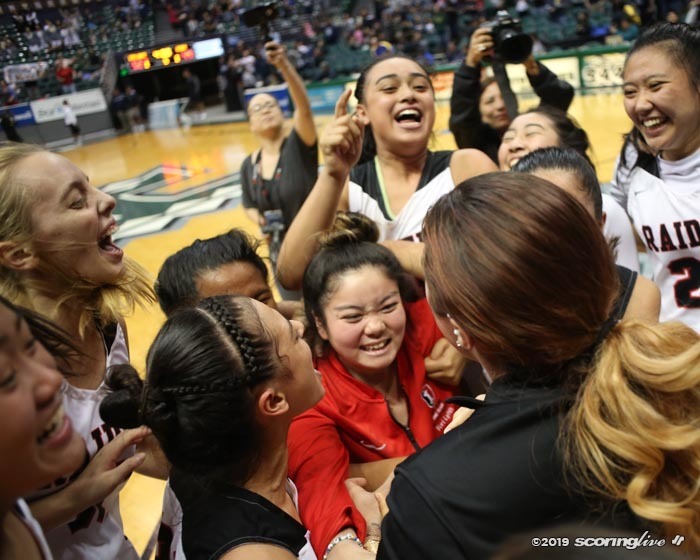 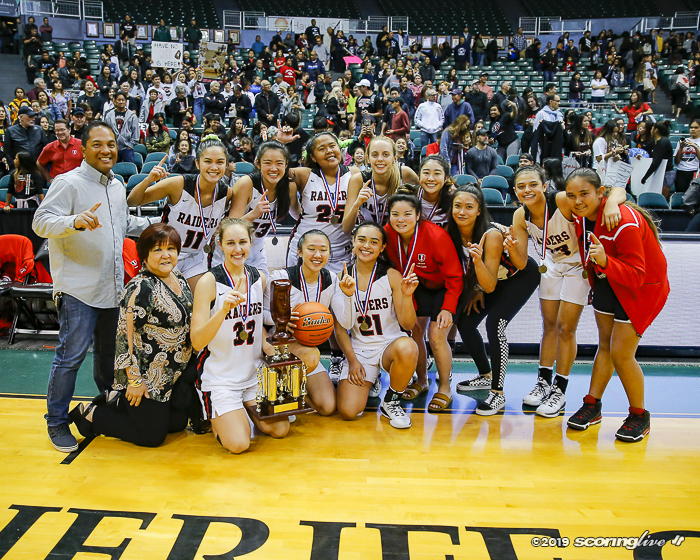 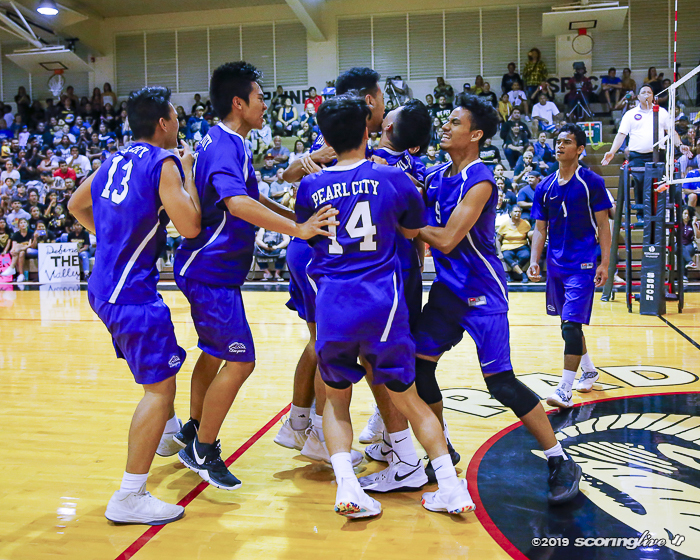 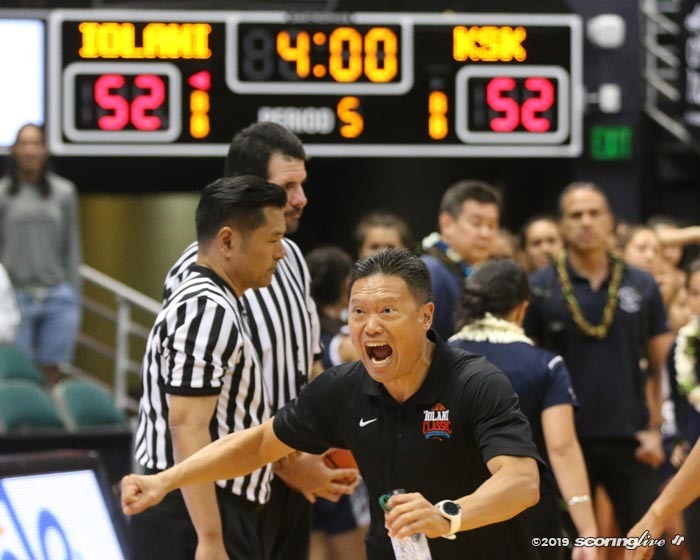 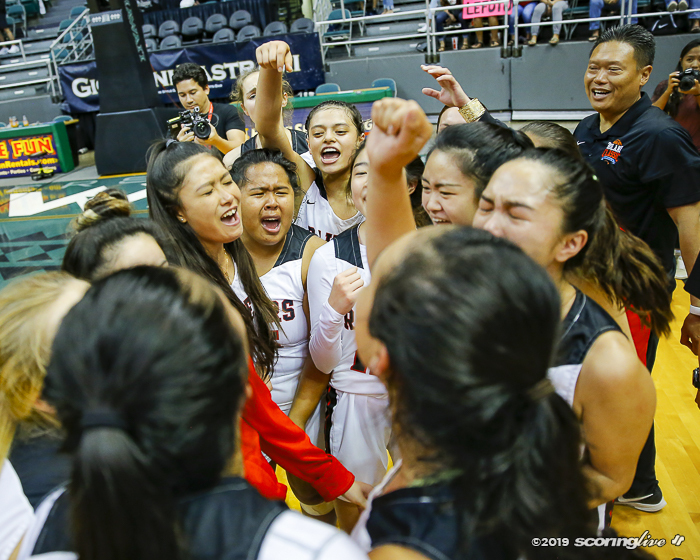 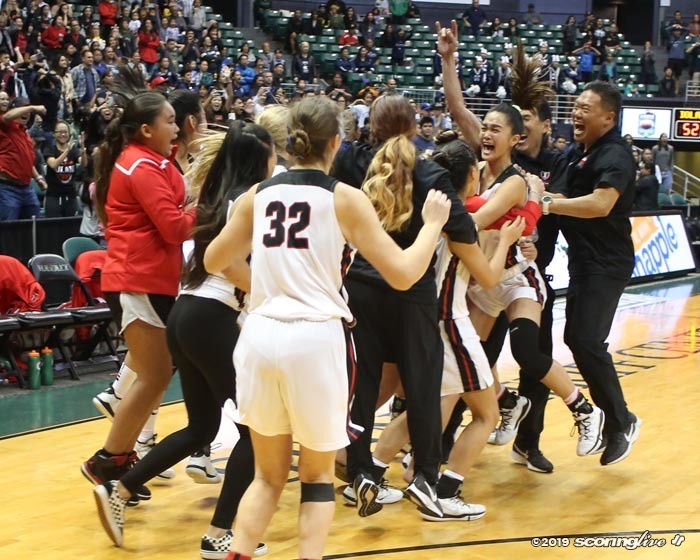 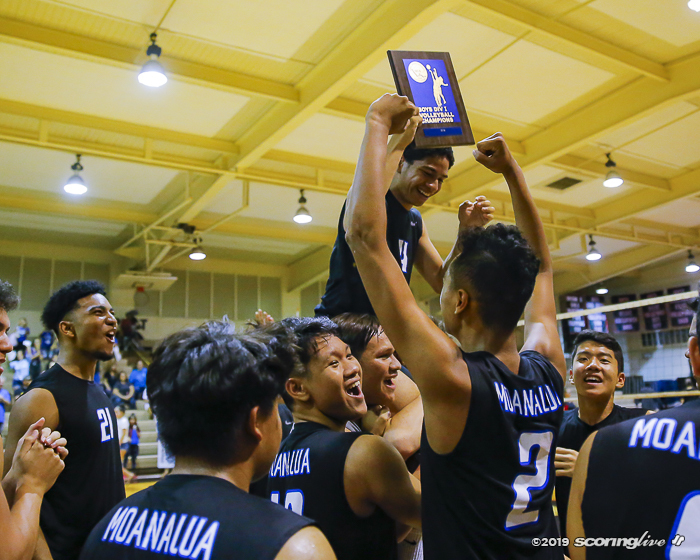 In live time, the referees signaled that the basket counted as both teams rushed the court in joy — Iolani thinking it won and Kamehameha thinking it forced overtime. 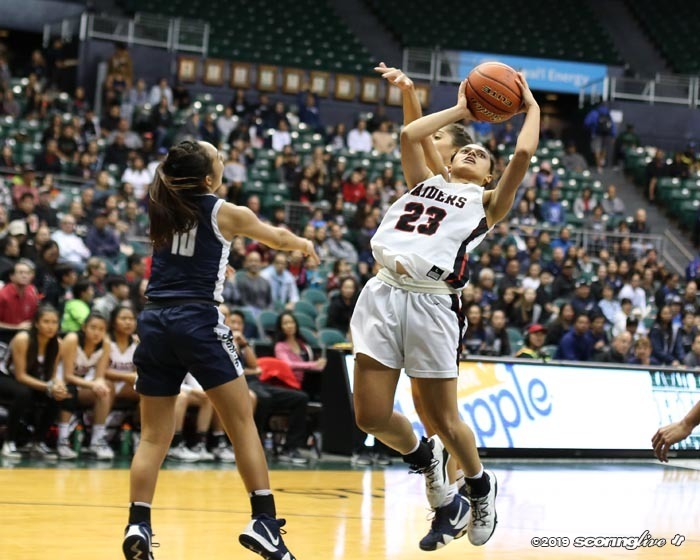 But a video review — allowable by the Hawaii High School Athletic Association — showed Obrey's desperation shot came after the light above the backboard was lit. 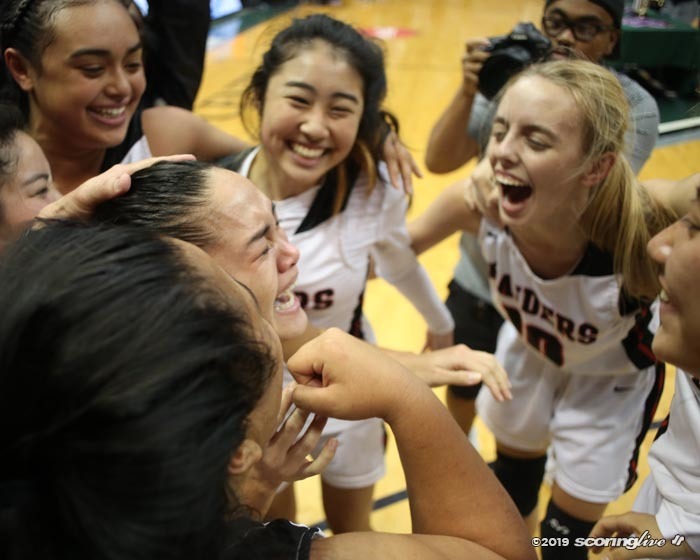 When referee Brandy Richardson gave the verdict, the Raiders were cheering while the Warriors were left in stunned disbelief. 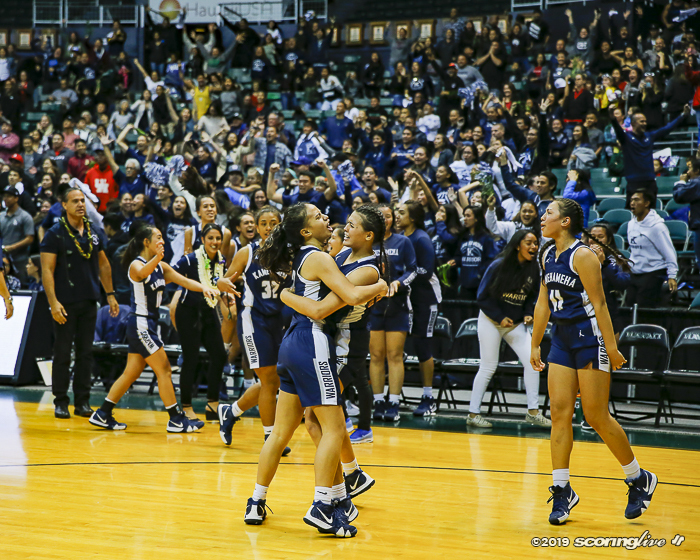 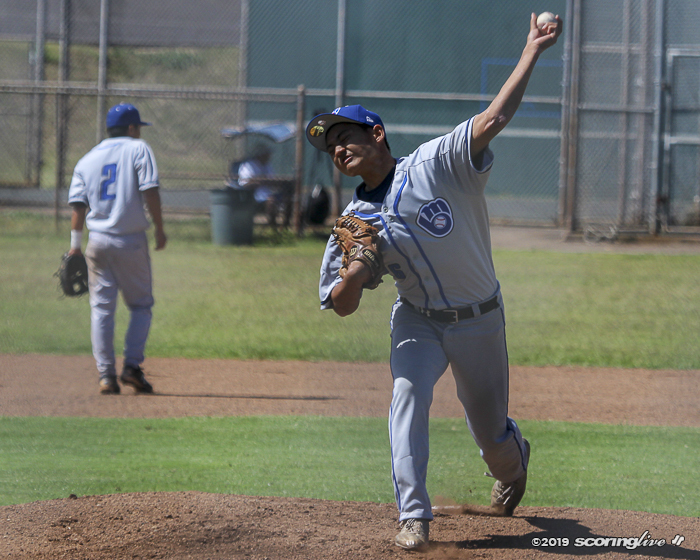 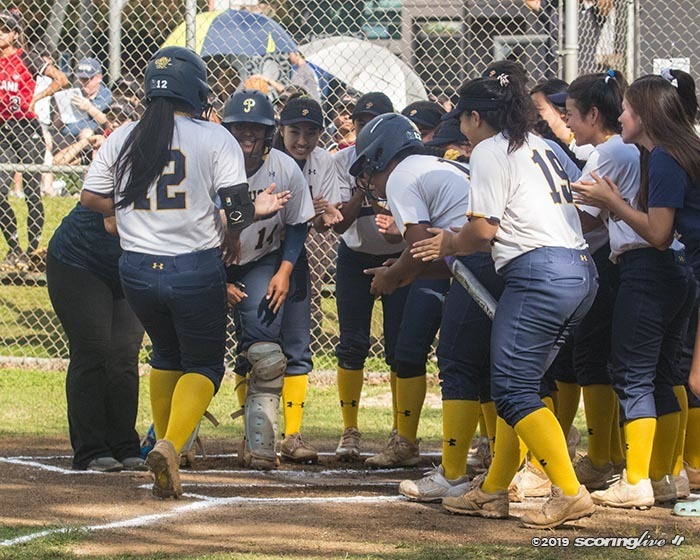 "It feels amazing, it's unbelievable, but my heart goes out to Kamehameha," Iolani coach Dean Young said. 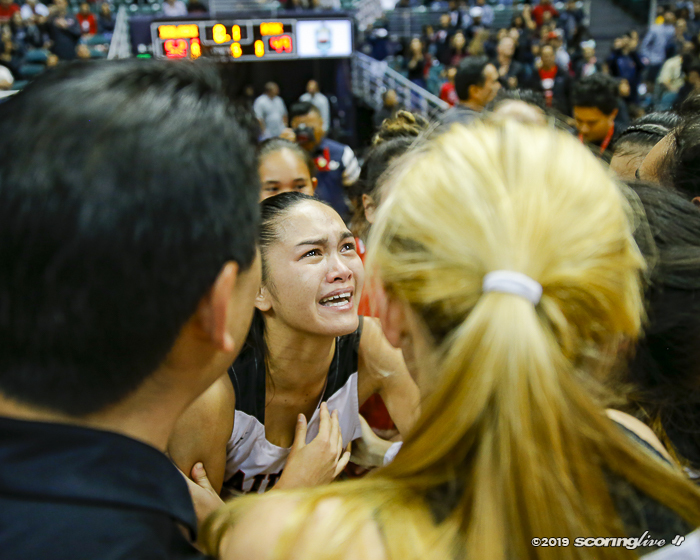 "That was an incredible battle. 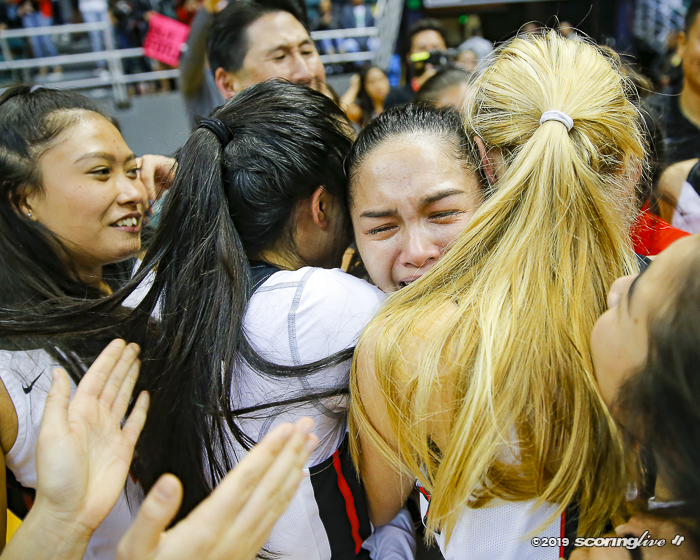 They fought with all their heart. 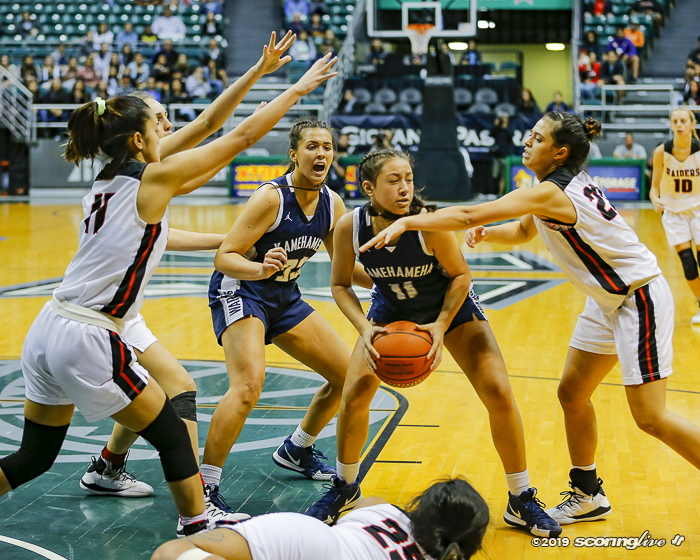 Somebody had to lose this game. 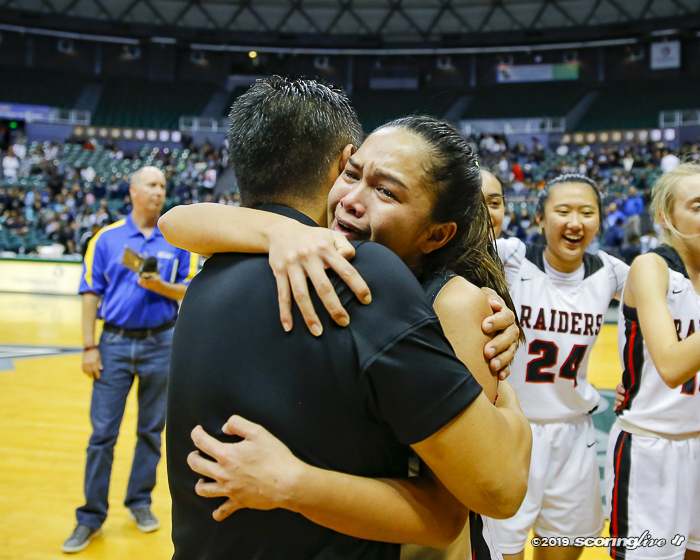 They played so tough, they should be so proud of themselves." 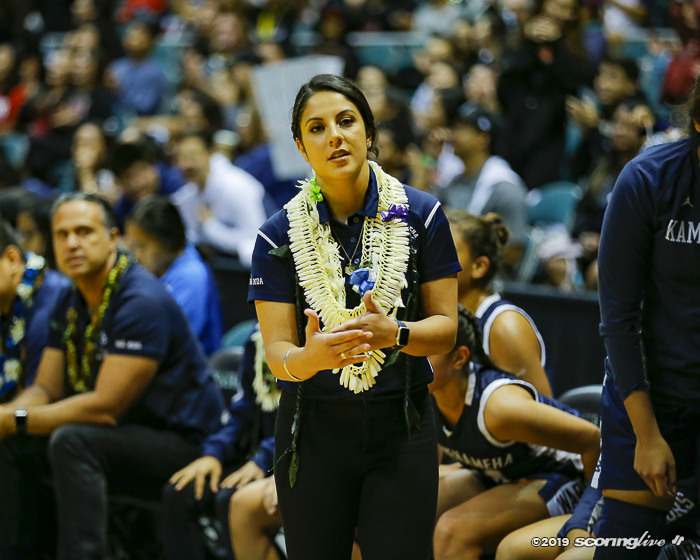 Kamehameha coach Pua Straight declined comment after two attempts. 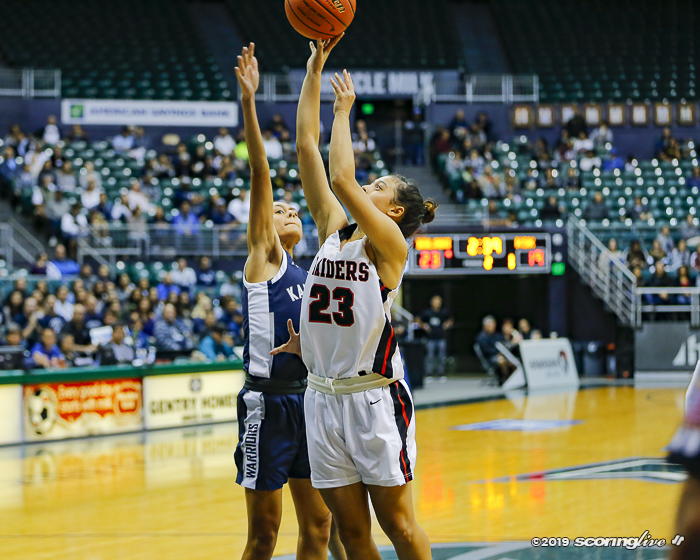 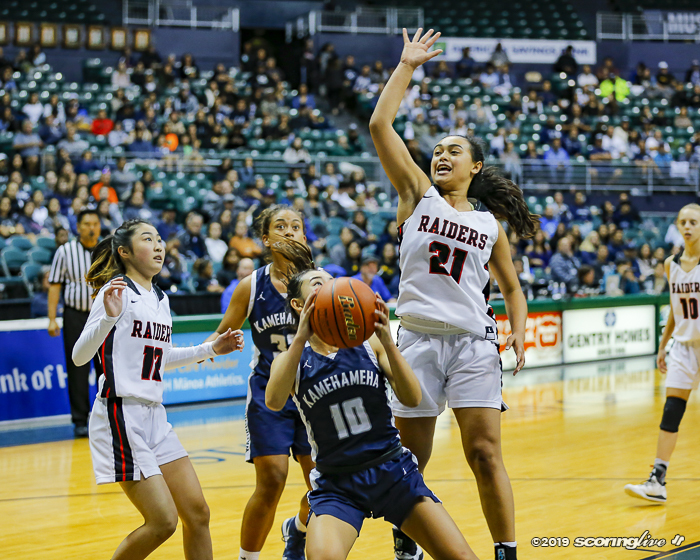 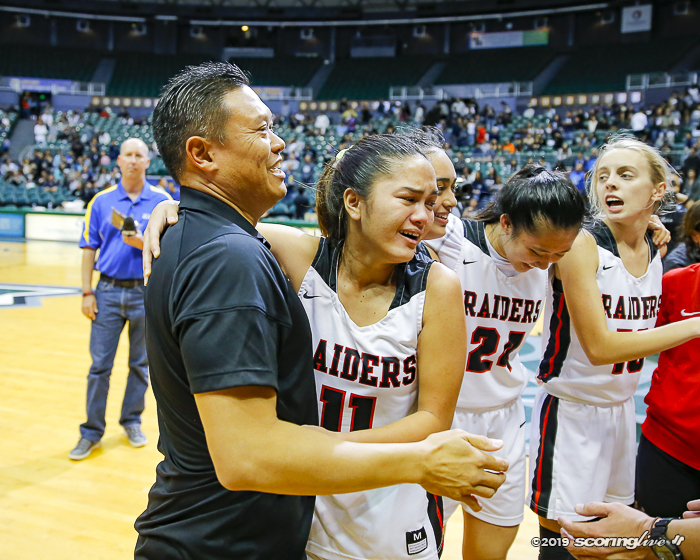 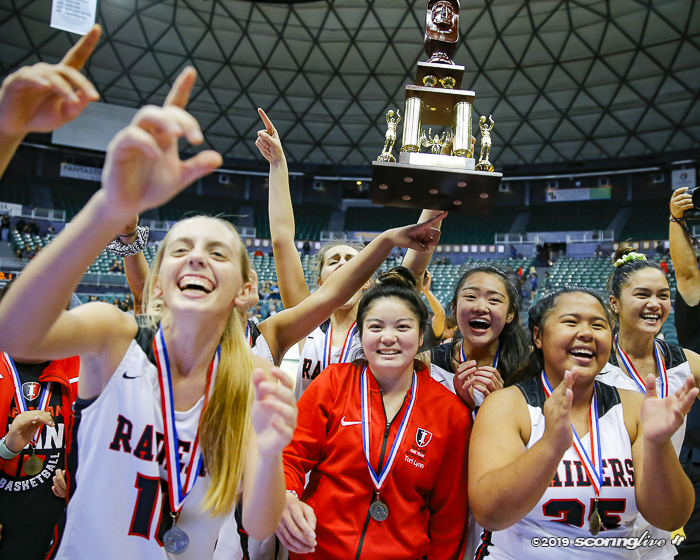 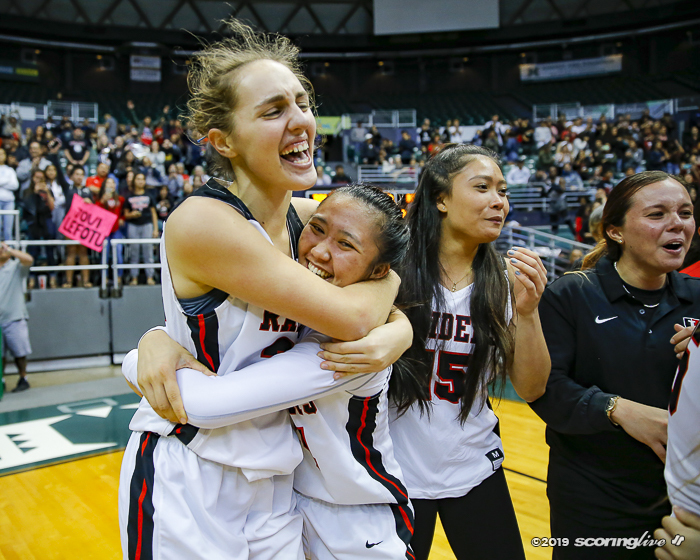 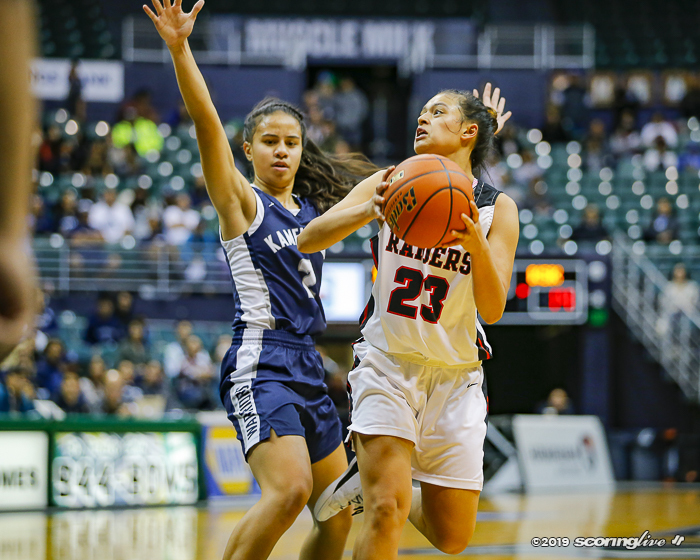 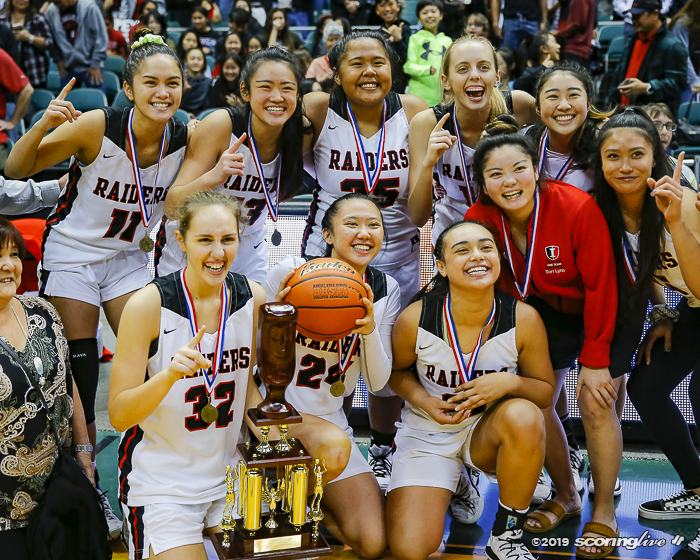 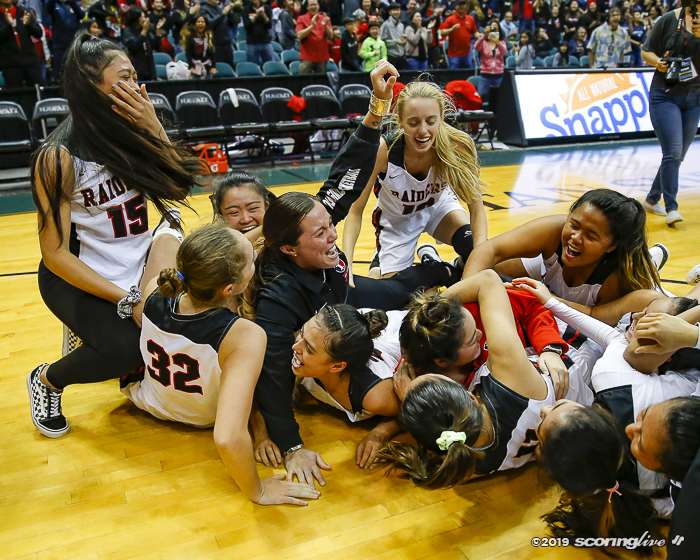 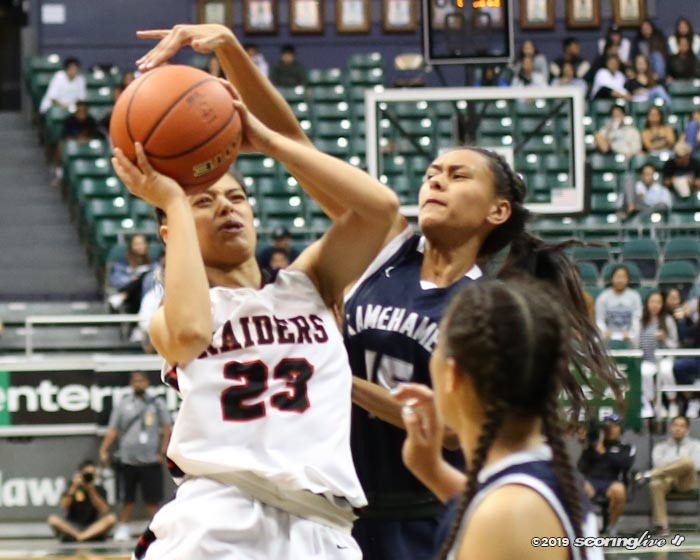 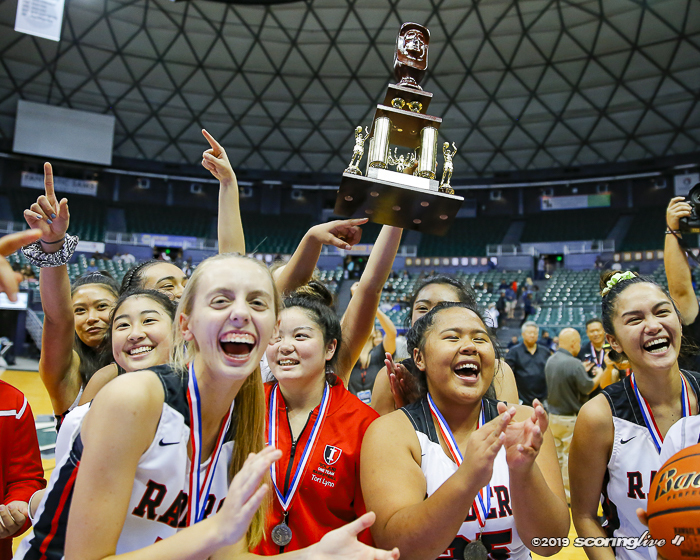 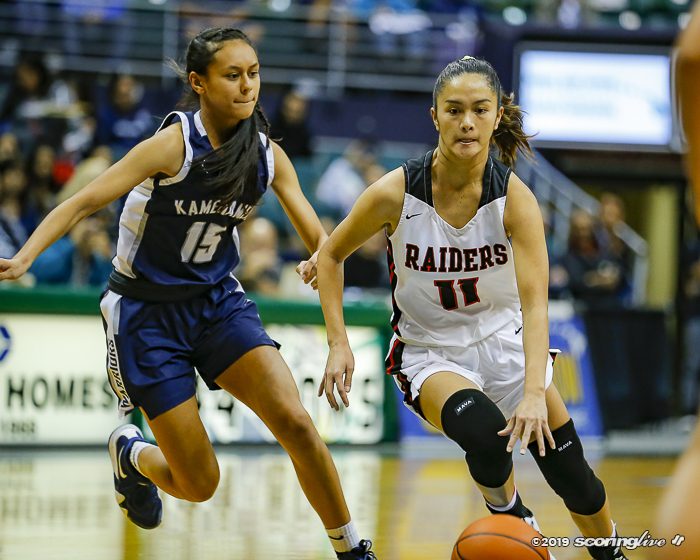 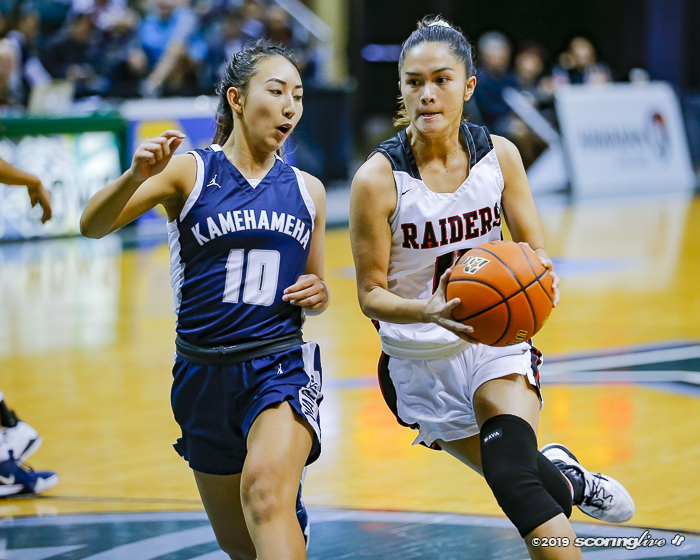 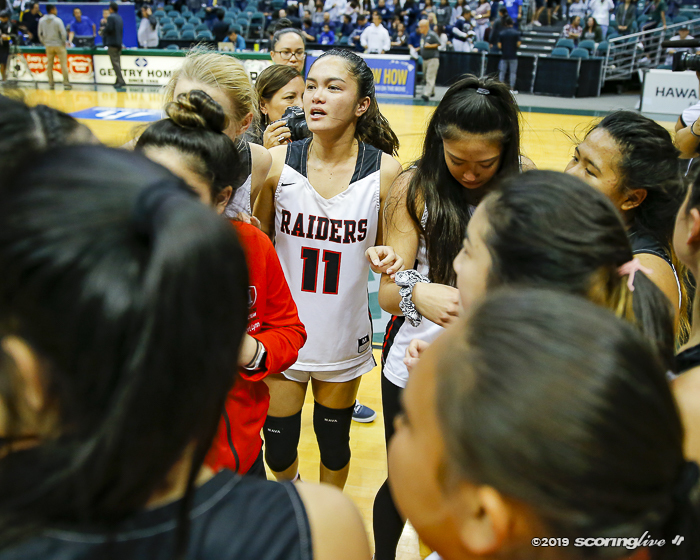 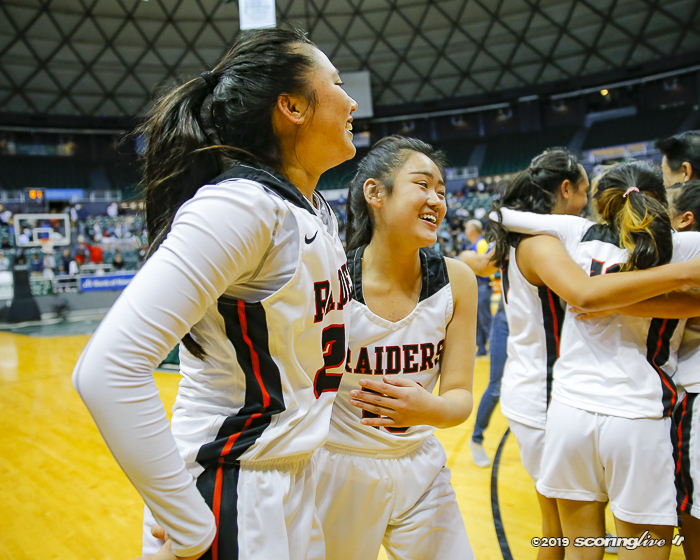 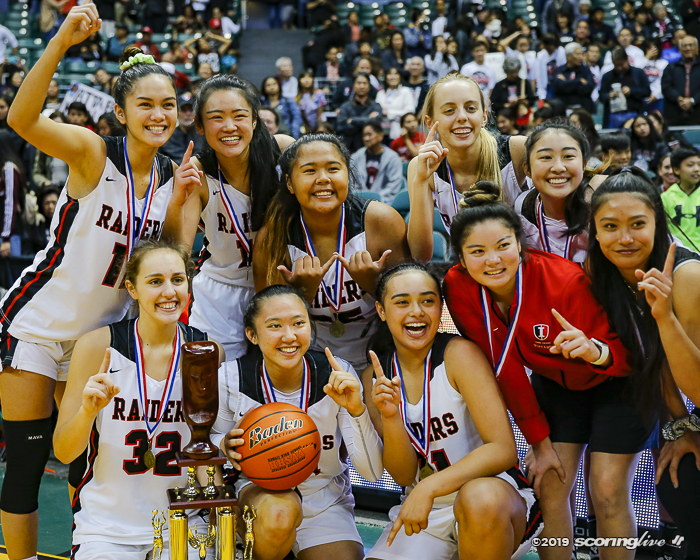 Taylor Wu and Lily Lefotu Wahinekapu combined for 36 points for the Raiders (14-1), who won their first crown since 1996 and fifth overall. 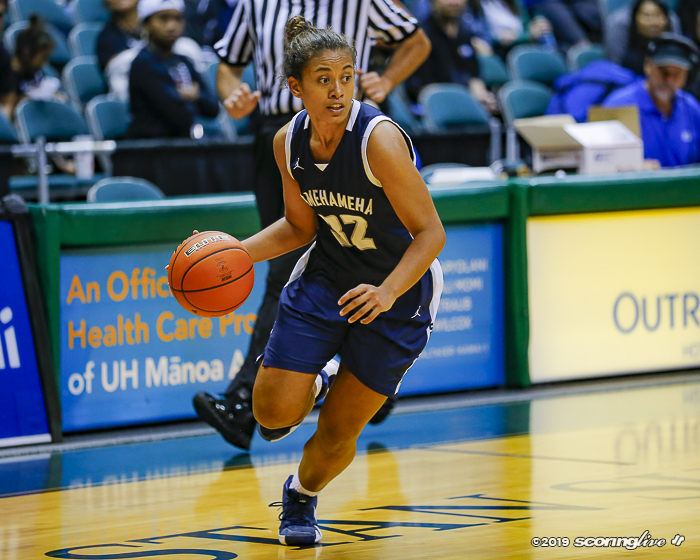 Obrey, who played nearly all 32 minutes, finished with a double-double — 24 points and 10 rebounds. 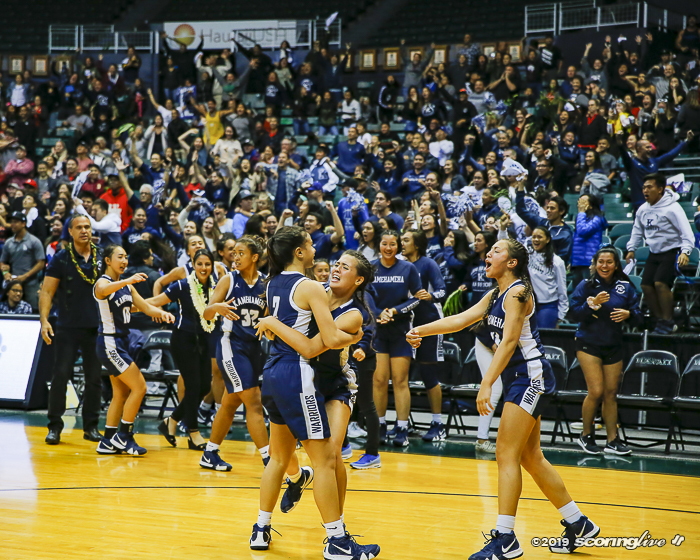 "To see them carry the No. 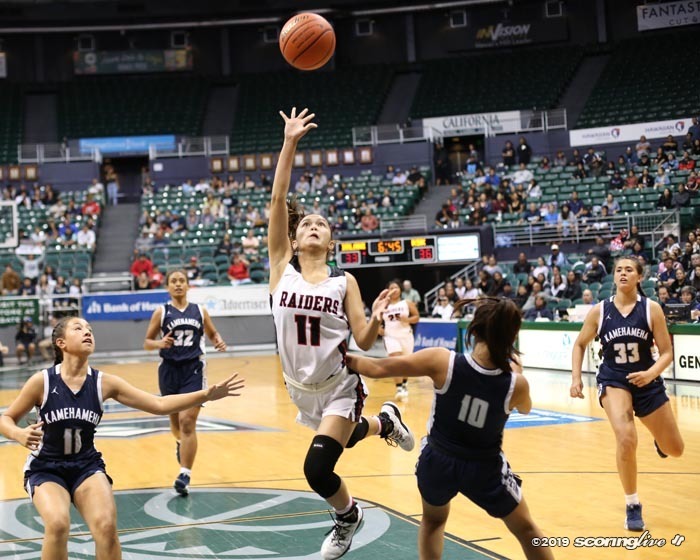 1 ranking from beginning to end is amazing," Young said of his Raiders. 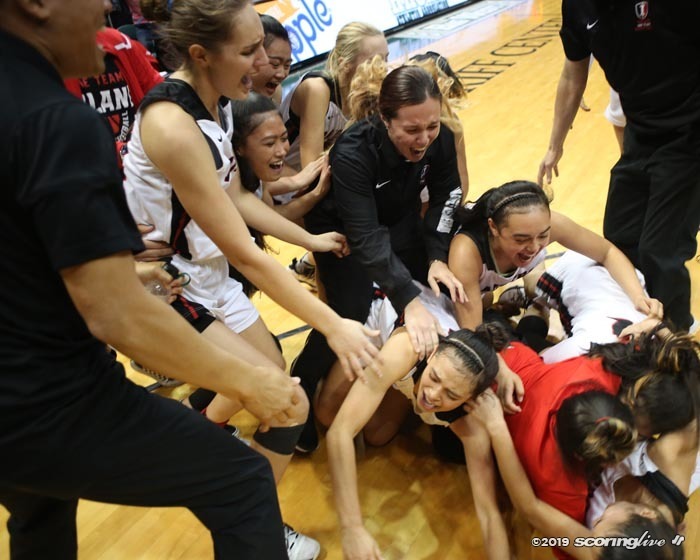 There have been fantastic finishes but never one that ended in this fashion. 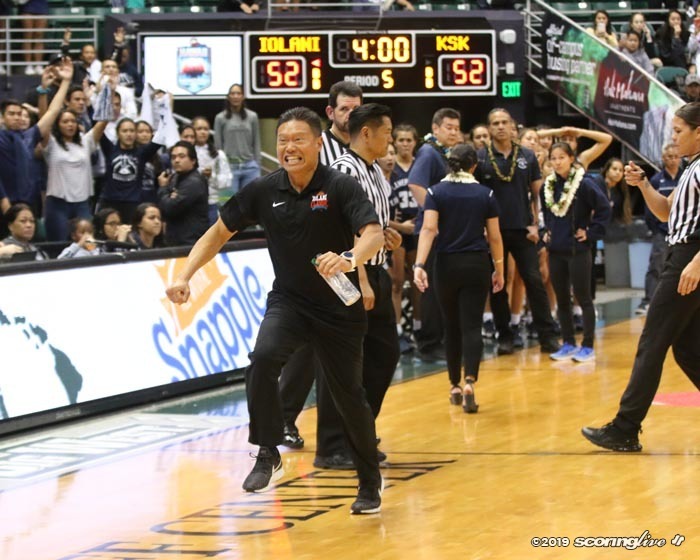 "We didn't know what to think because the refs didn't know if they were allowed to go with replay or not," Young said. 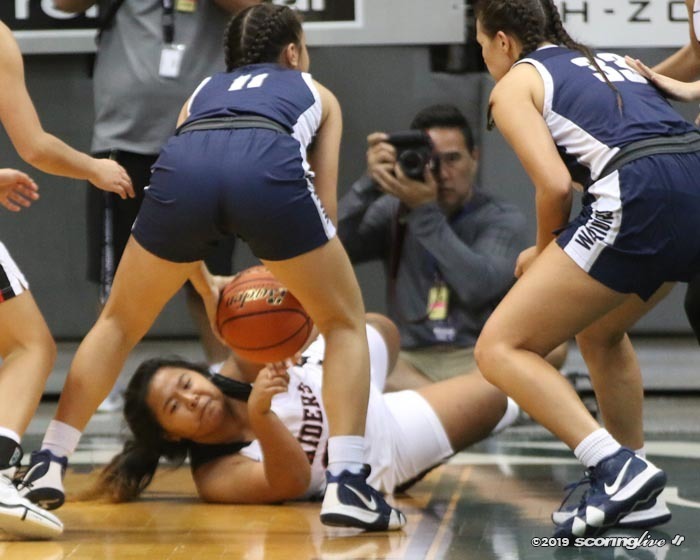 "Some of the refs were calling it good. 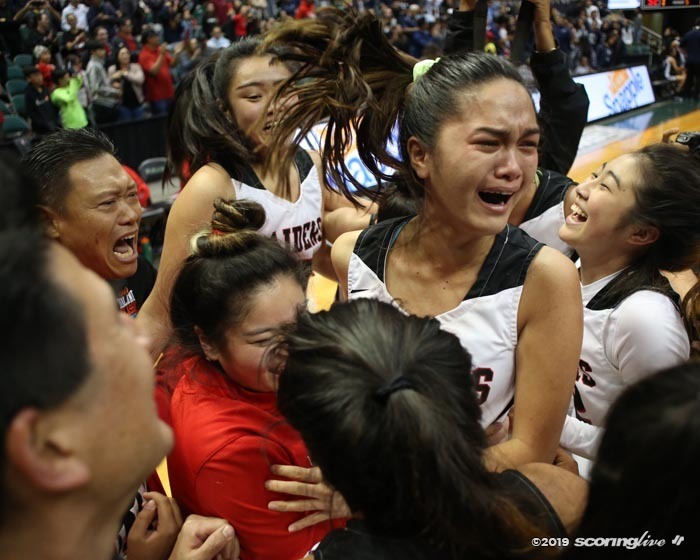 They weren't sure they could, so they had to check. 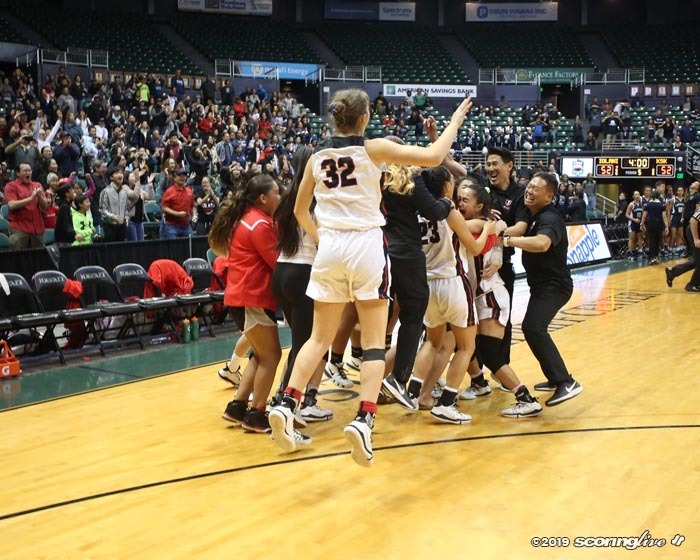 They came back to us and said replay is allowed in the state final. 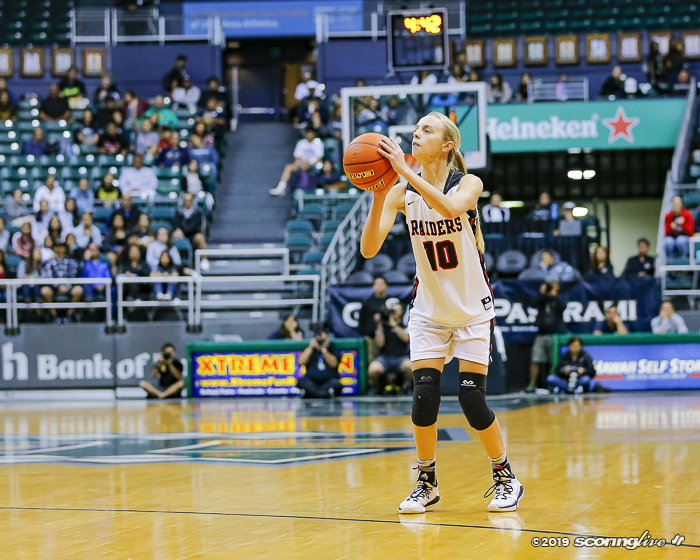 When the red light was on, the ball was still in her hands. 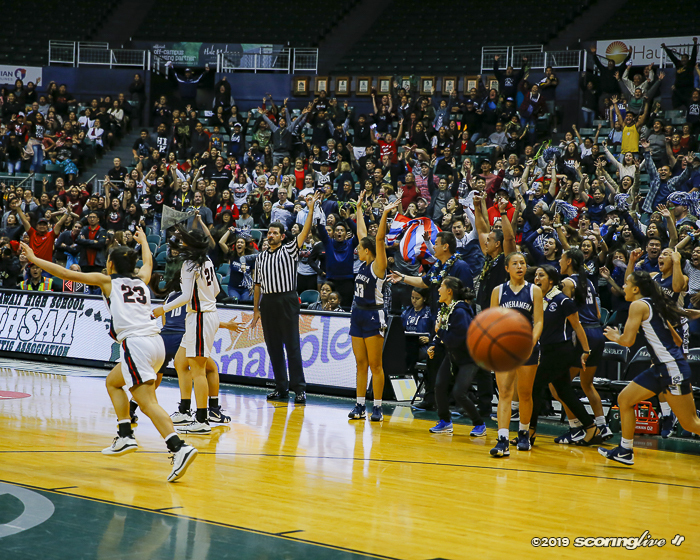 The basket does not count." 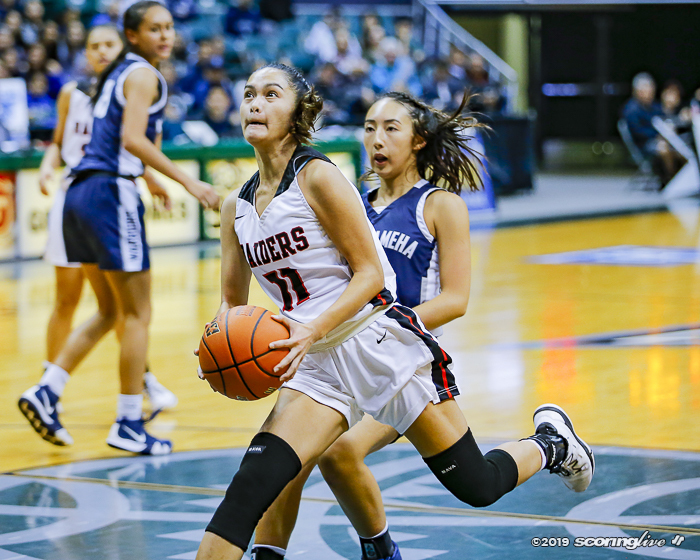 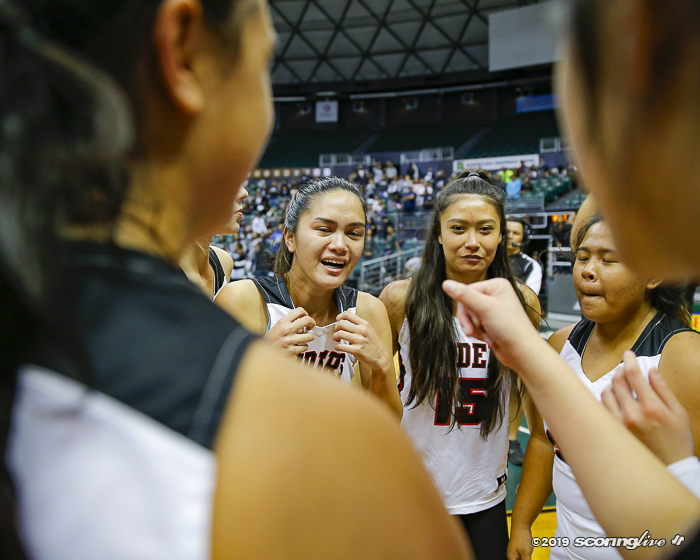 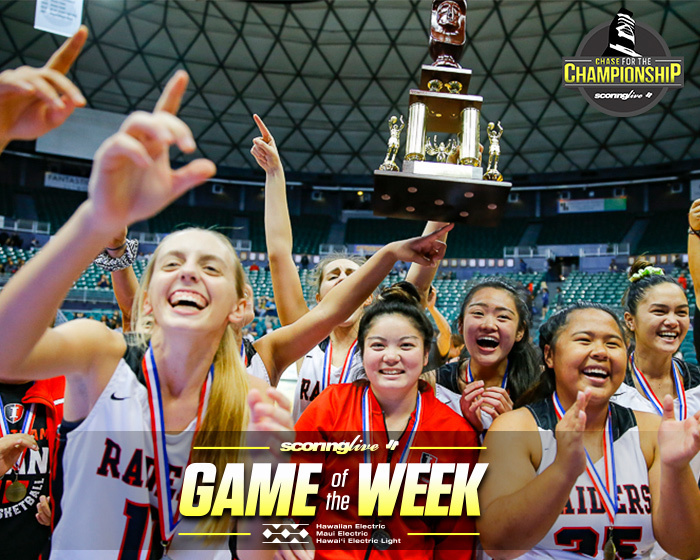 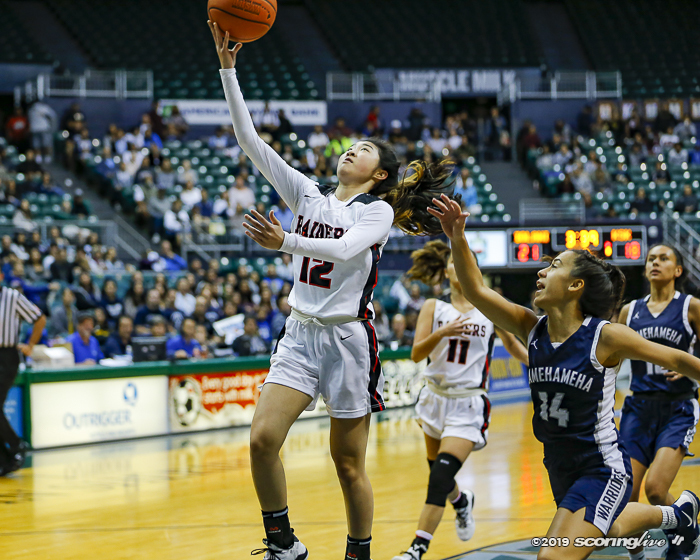 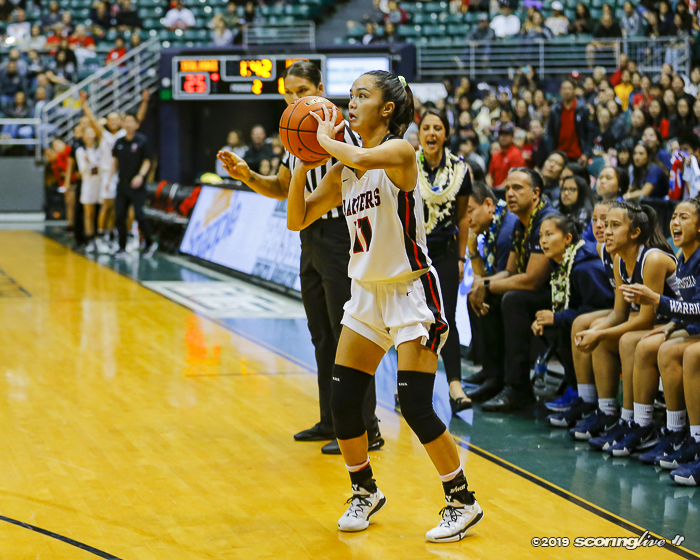 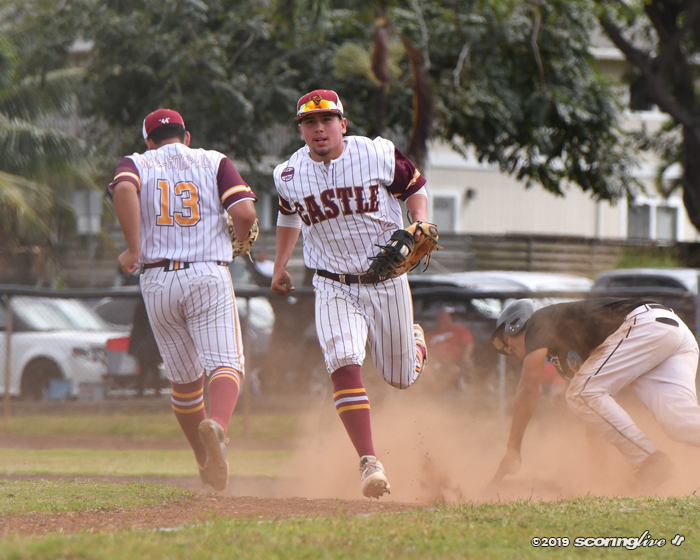 The evenly-matched contest — the fourth time the teams have played, with Iolani winning three times — saw six lead changes. 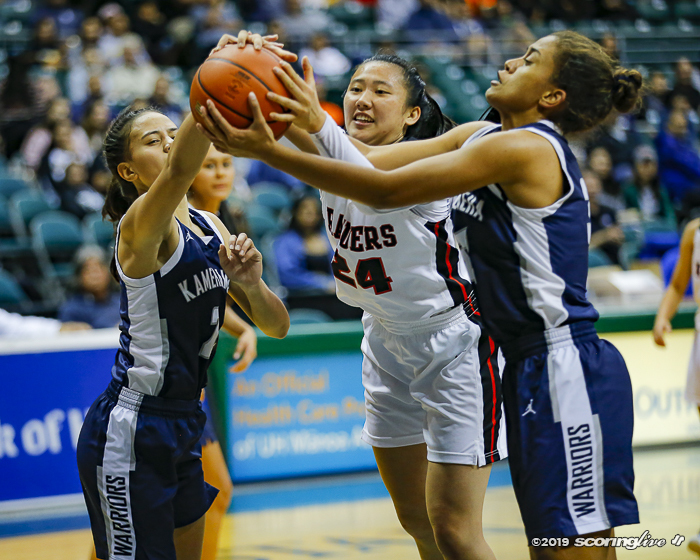 The game was tied at 25 at the half with the Warriors overcoming a six-point deficit at one point. 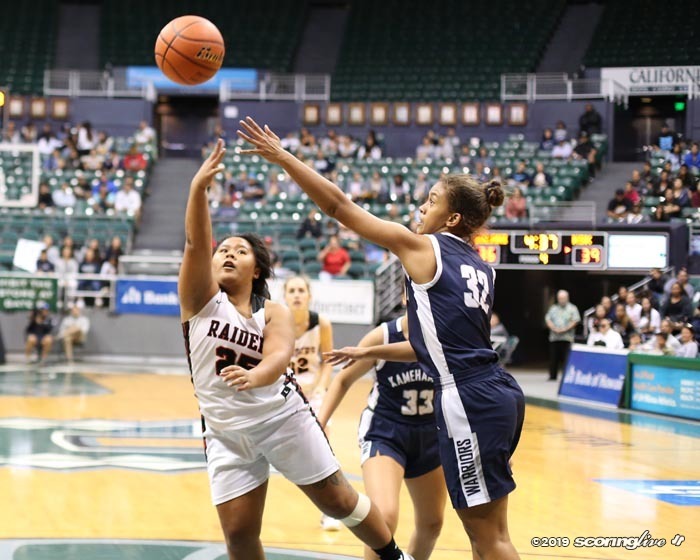 Lefotu Wahinekapu's personal six-point run to open the second half gave the Raiders a 31-25 lead. 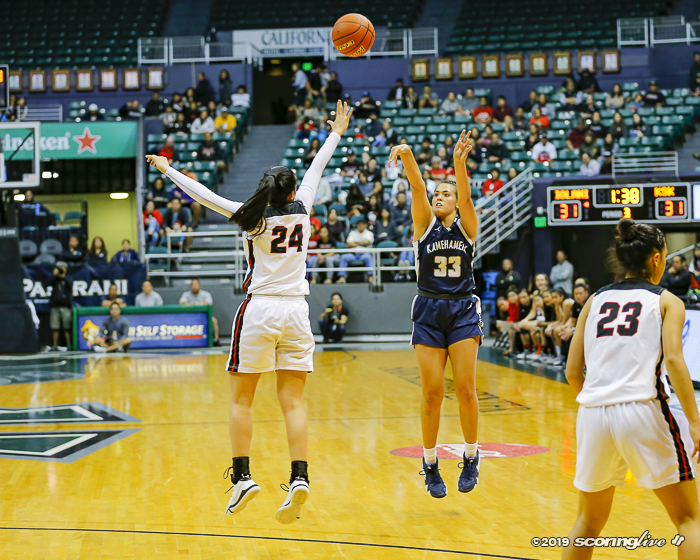 But the Warriors tied the game at 31 and took the lead on Obrey's 3-pointer, 34-31, with 1:38 in the third. 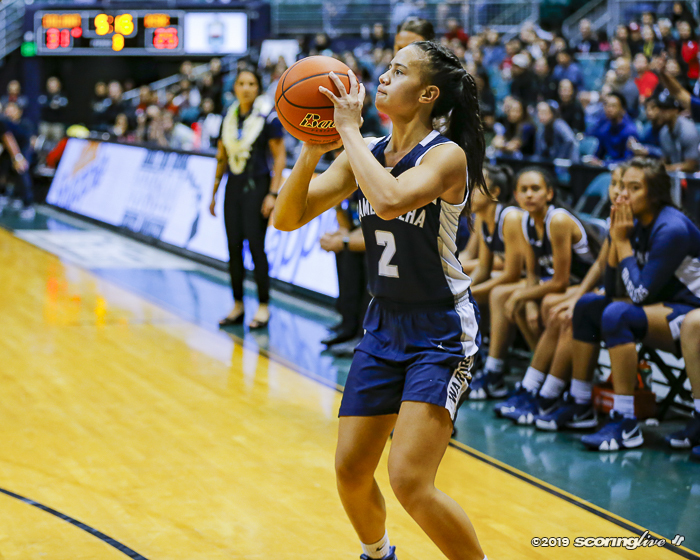 Noelle Sua-Godinet added another basket to make it 36-31 entering the fourth period. 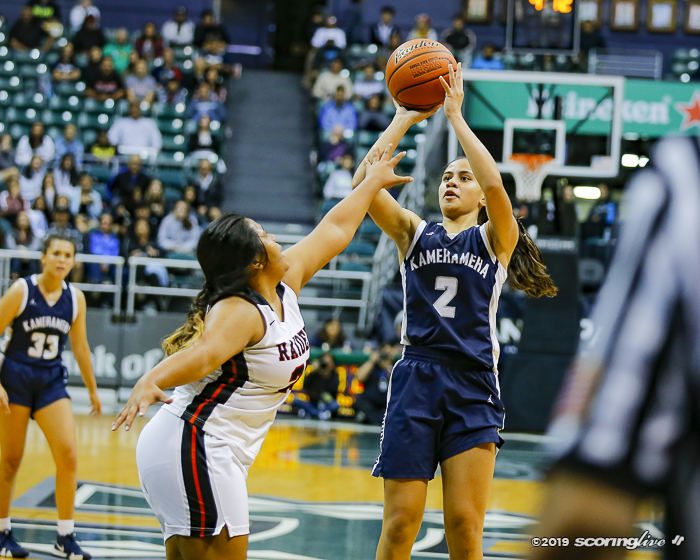 Kamehameha (12-5) had a 40-36 lead with 3:29 left after Obrey made one of two free throws. 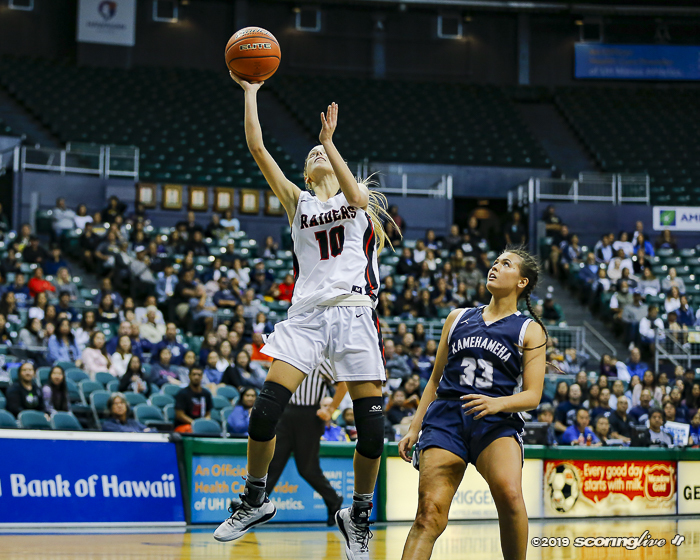 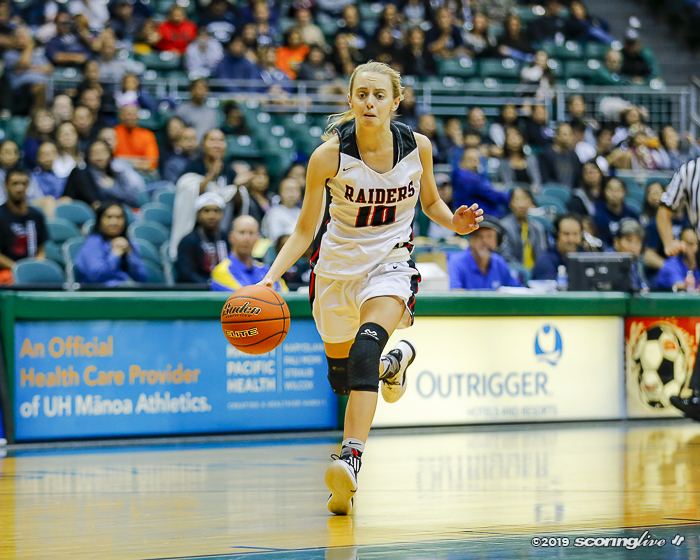 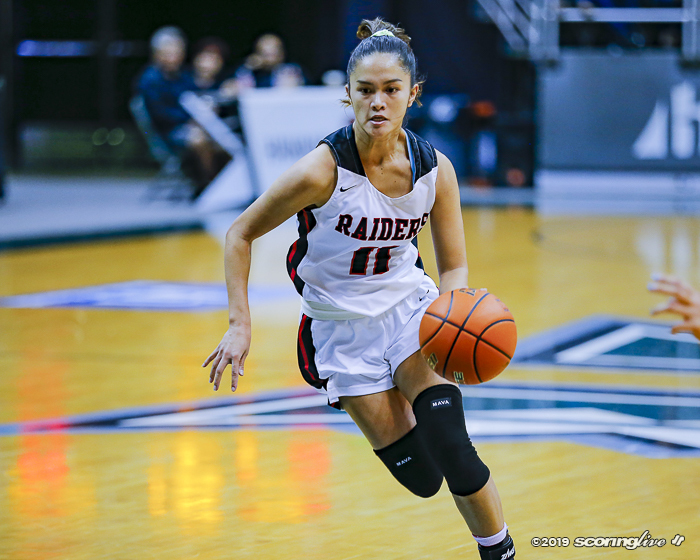 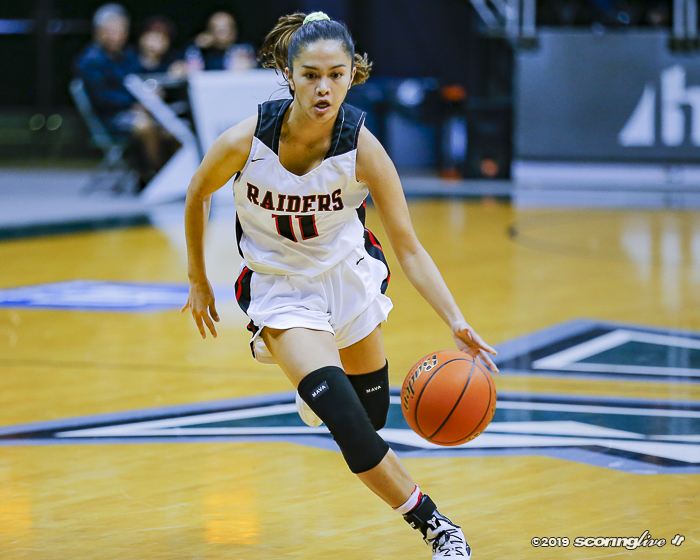 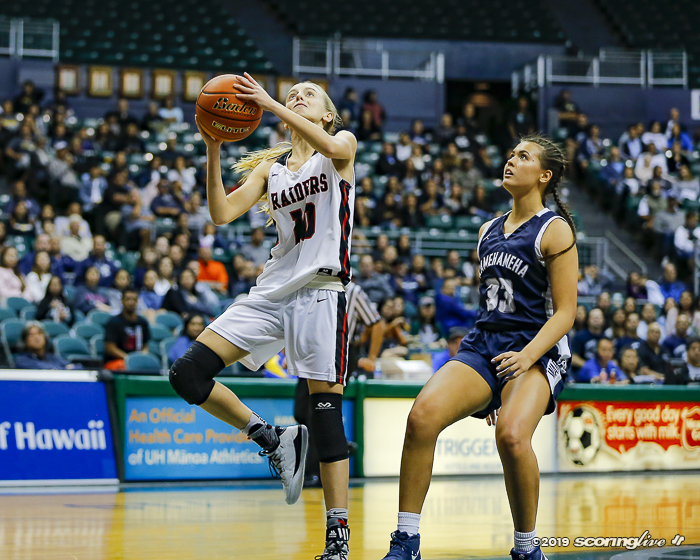 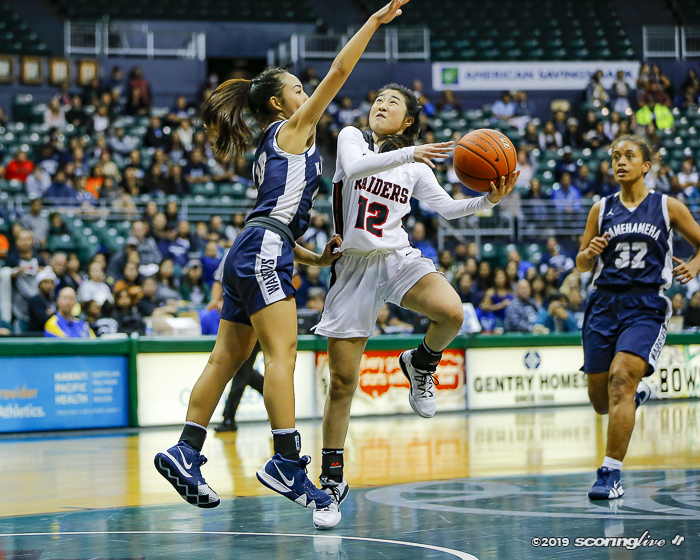 But Wu, who scored 13 of her team-high 19 points in the second half, jump-started the Raiders' comeback with a pair of 3-pointers, the second coming after a turnover, to give Iolani a 42-40 lead with 2:53 left in the game. 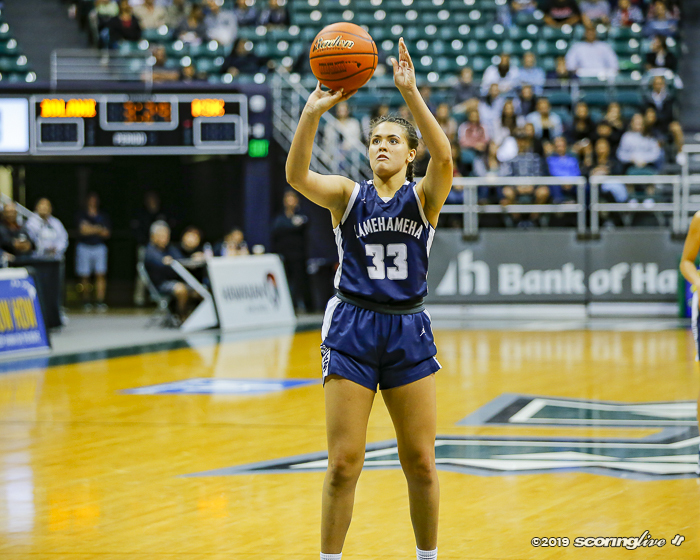 She added two free throws with 1:47 left to make it 44-40. 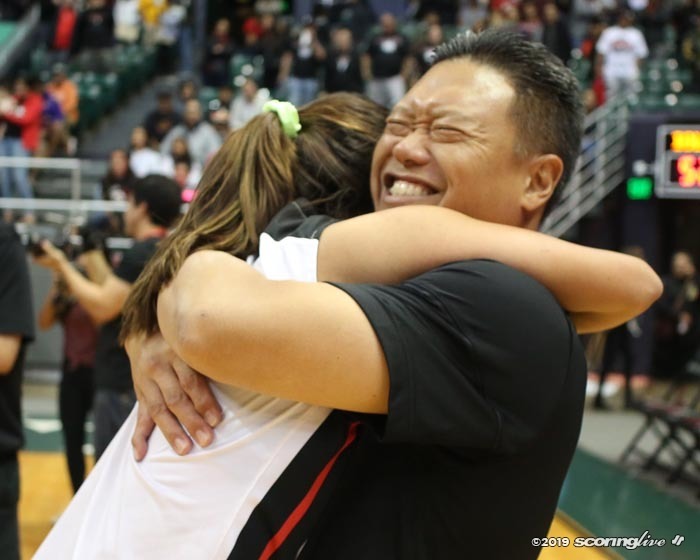 "They called the play and I knew those plays were for me," Wu said. 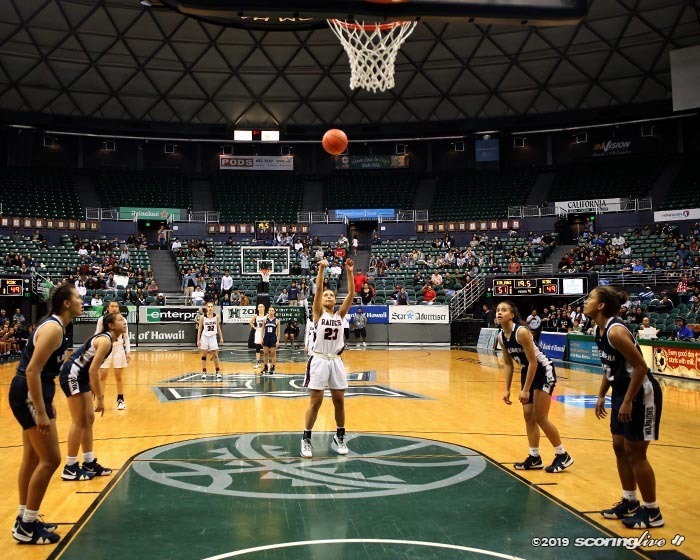 "I had confidence in my shot. 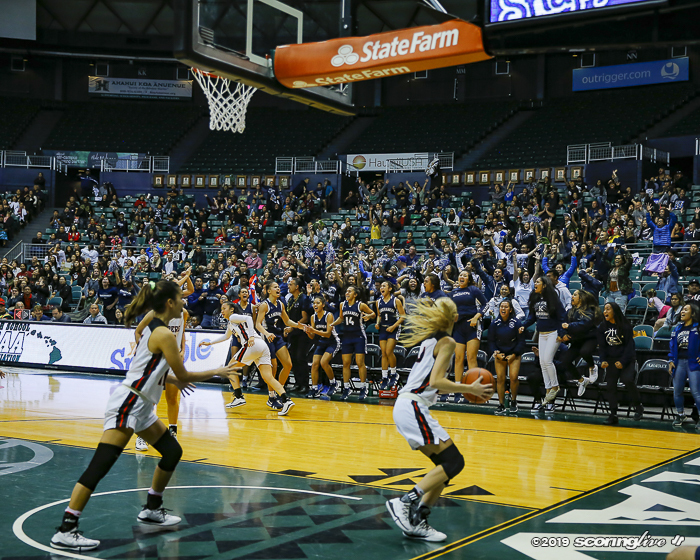 I knew it was going in and they went in." 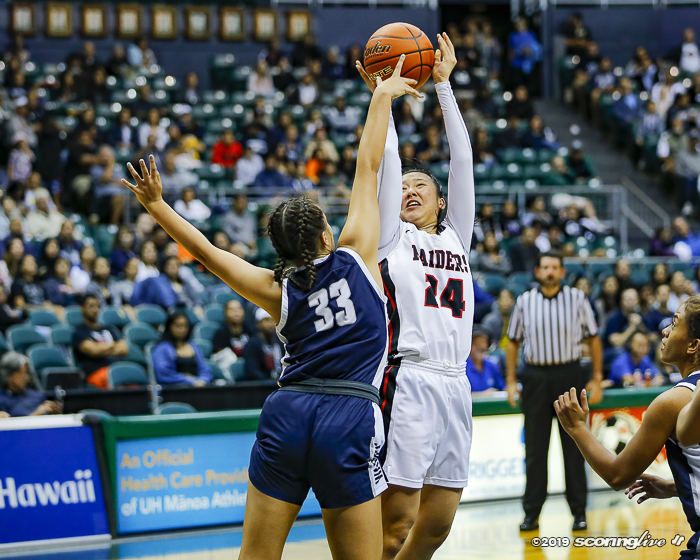 The Warriors made it a one-possession game with 1:26 left when Obrey made two free throws but that was later offset by Alexis Huntimer's two free throws with 1:23 left. 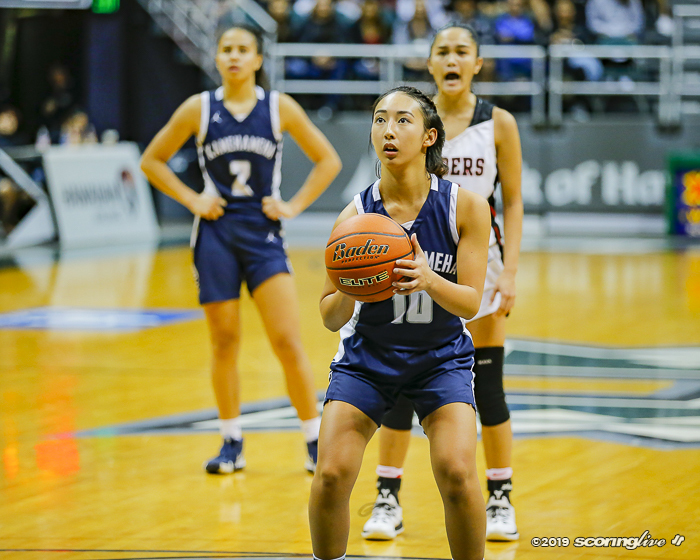 Two free throws by Obrey with 54 seconds left made it a one-possession game again, but Wu covered that by making her double-bonus free throws. 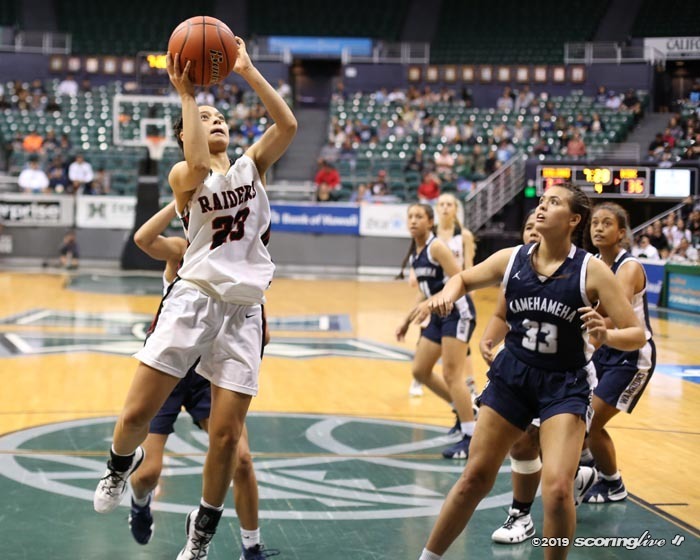 Malie Marfil's 3-pointer with 41 seconds left pulled the Warriors to within one. 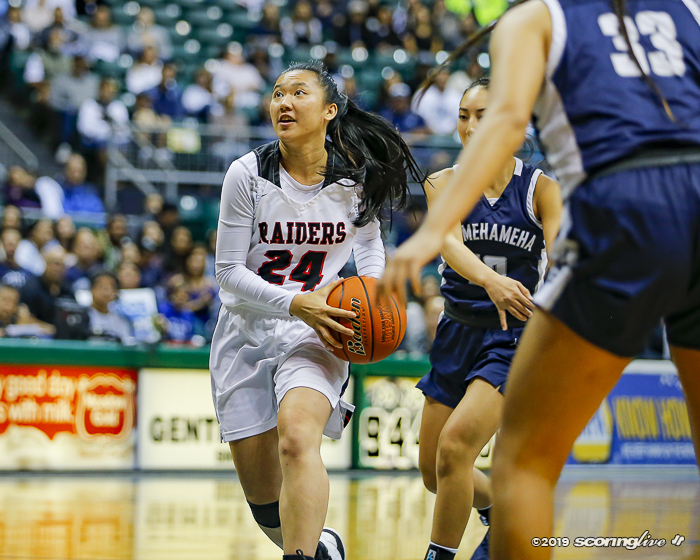 Wu converted her double-bonus free throws to increase Iolani's lead to 50-47. 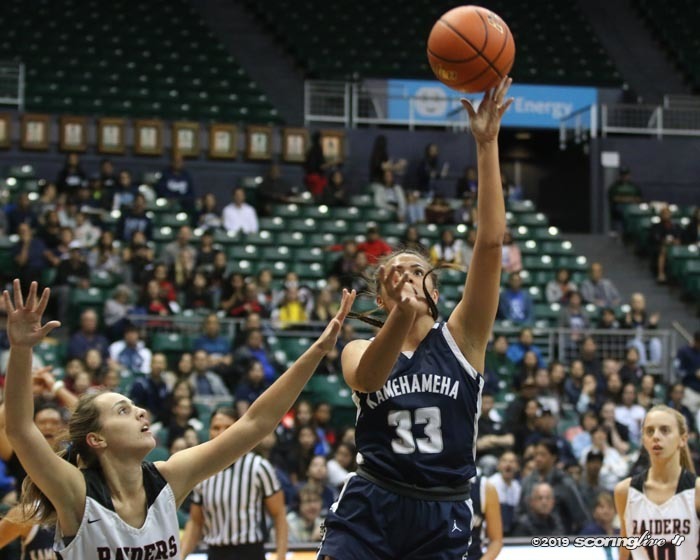 Obrey's driving jump with 23 seconds left pulled Kamehameha to within one. 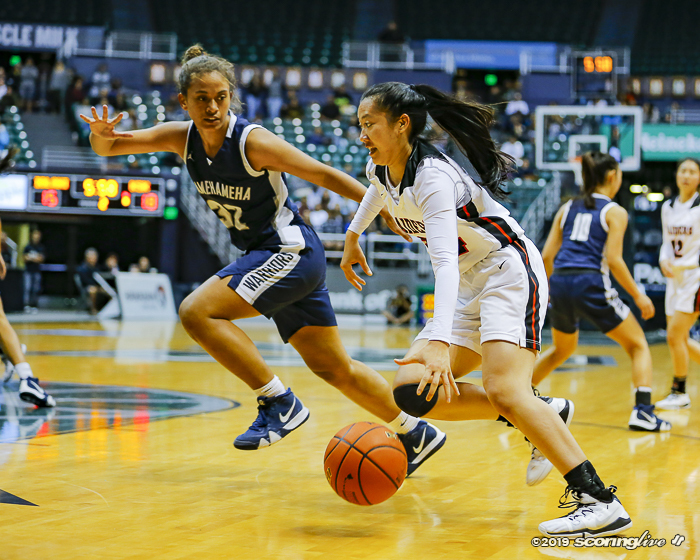 On the play, Wu fouled Obrey and fouled out. 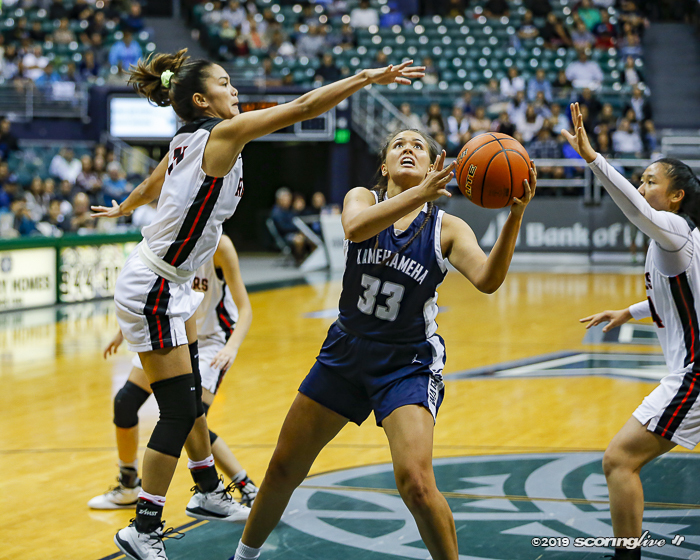 Obrey missed the free throw and potential tying point and Lefotu Wahinekapu got the rebound. 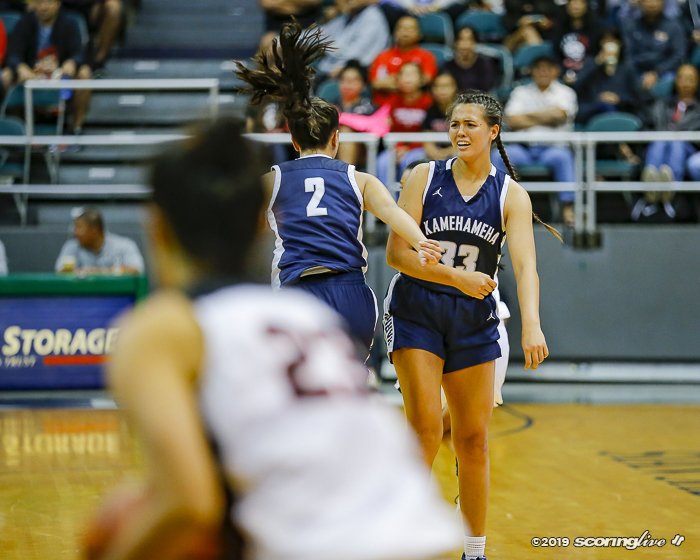 She got fouled and made her double-bonus free throws to make it 52-49 with 19.5 seconds left. 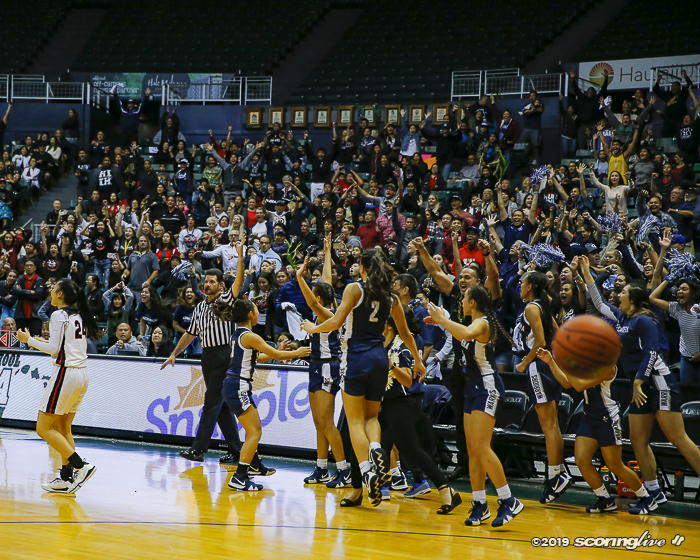 Two seconds later, the Warriors called time. 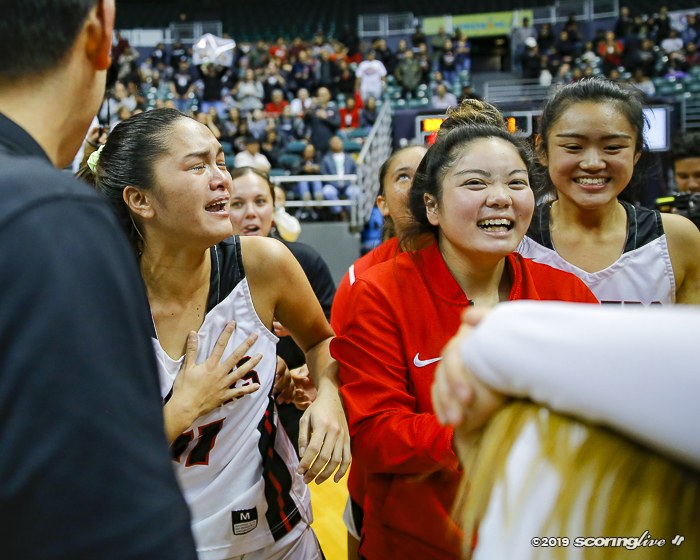 When time returned, Haley Masaki missed a 3-pointer with seven seconds left. 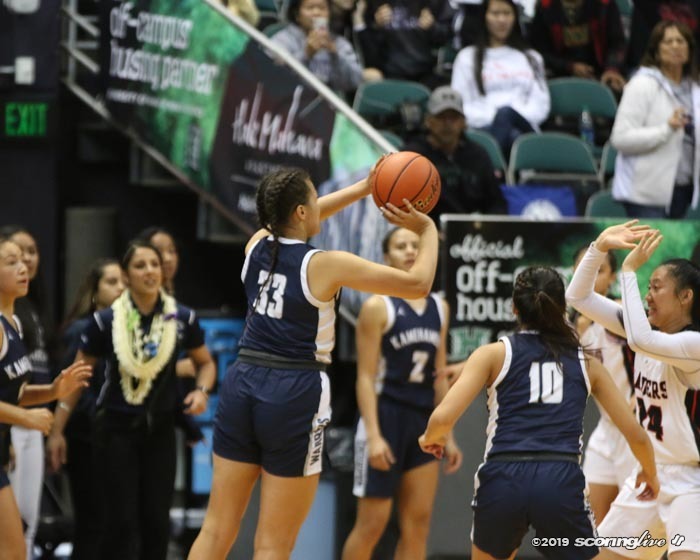 Marfil got the rebound, and the ball somehow got to Obrey deep on the left wing where she fired her shot that was eventually deemed after the light went off. 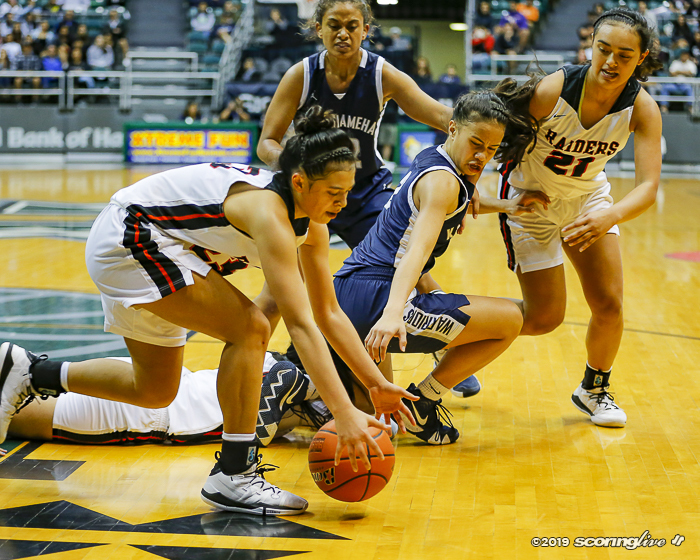 "I was just watching my man," Lefotu Wahinekapu said. 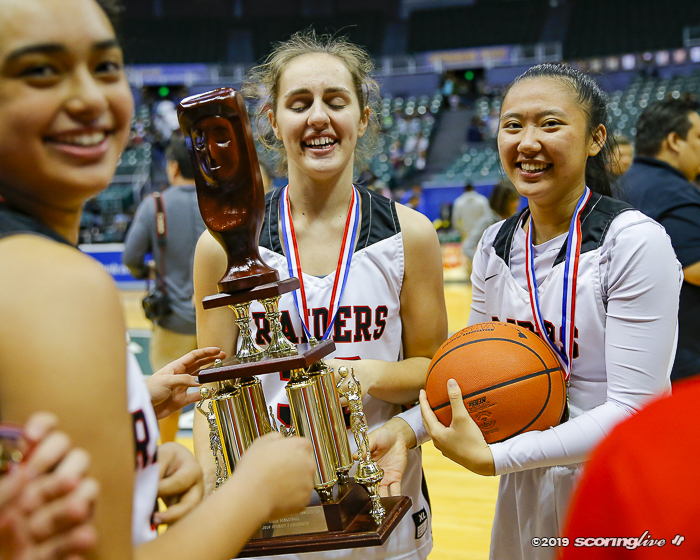 "I thought they were going to give it to Marfil, but I don't know how Kalina got the ball." 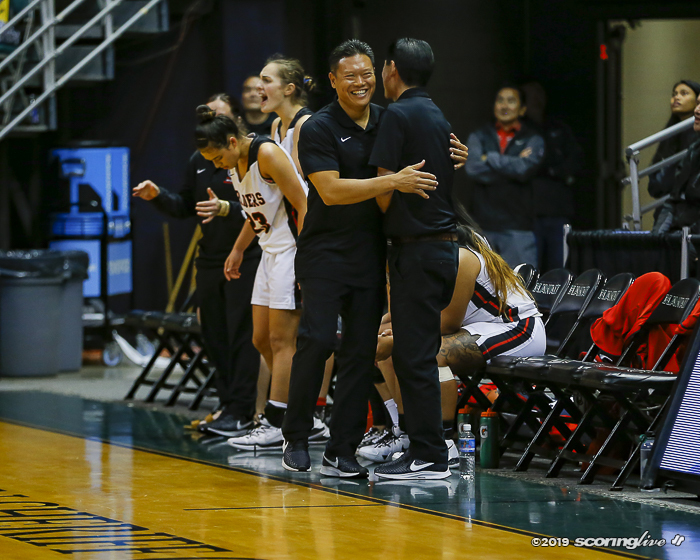 Wu, who was on the bench after fouling out, could only watch the unforgettable finish. 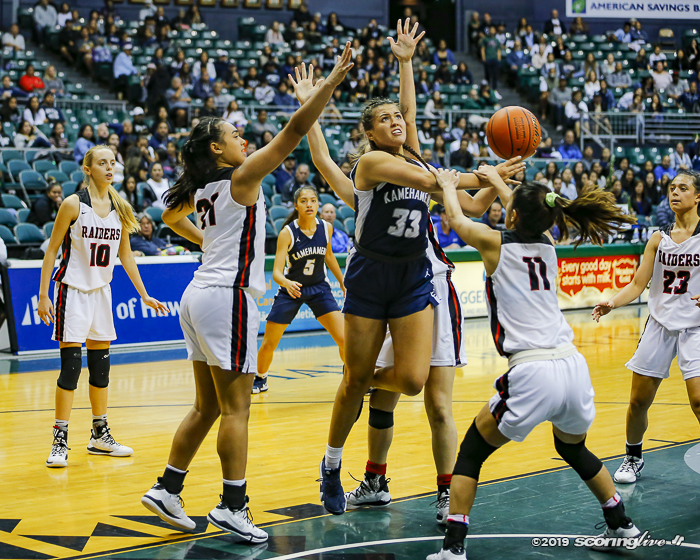 Since Iolani's bench was on the far side from Kamehameha's basket, she had a view of the light and Obrey's shot. 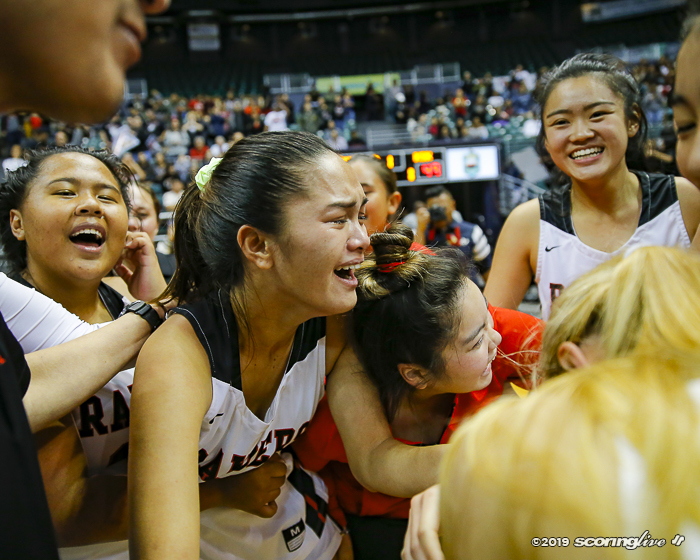 "I was confident 100 percent that that buzzer buzzed before she shot it," Wu said. 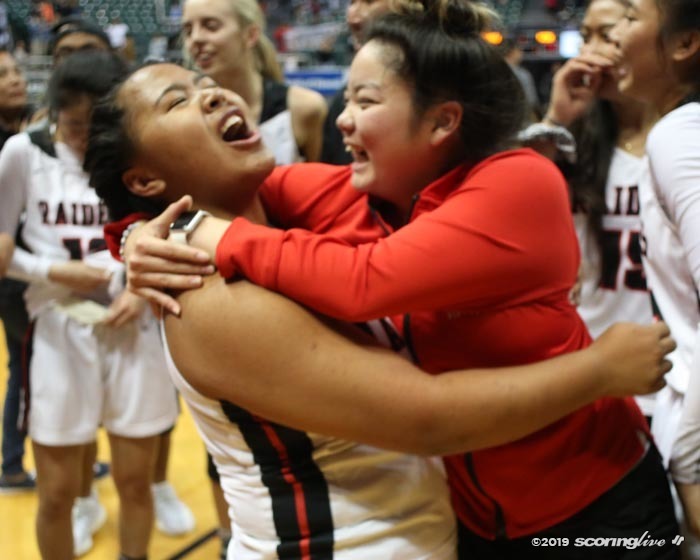 "I started cheering, started running on the court myself when I saw the red light go off and I knew it couldn't have counted. 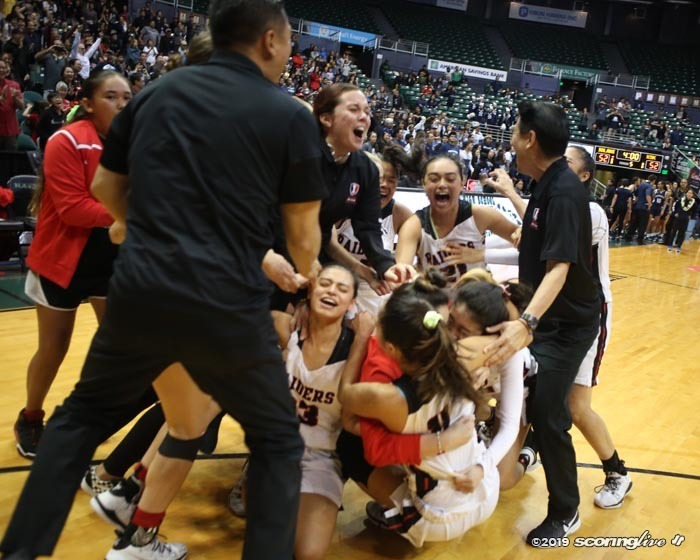 If it did count, I believed in my team if we had to go overtime." 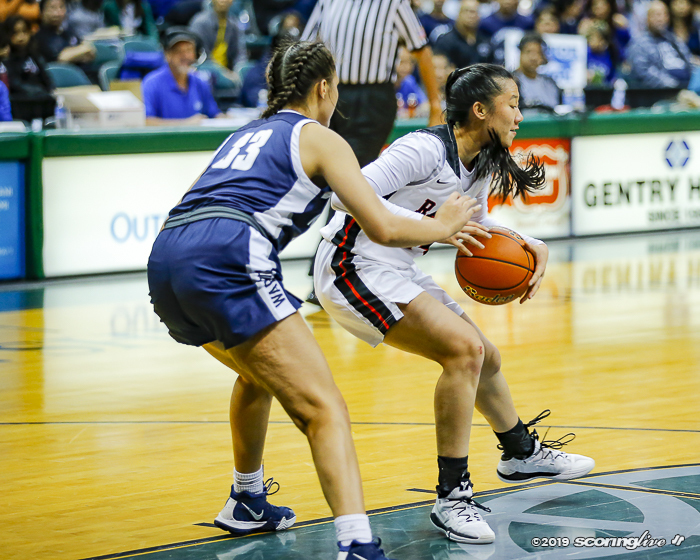 Wu, one of two active seniors (the other is Shyann Kawai Kahalehoe) on the team, had confidence in her teammates to hold the lead without her on the court in the final 23 seconds. 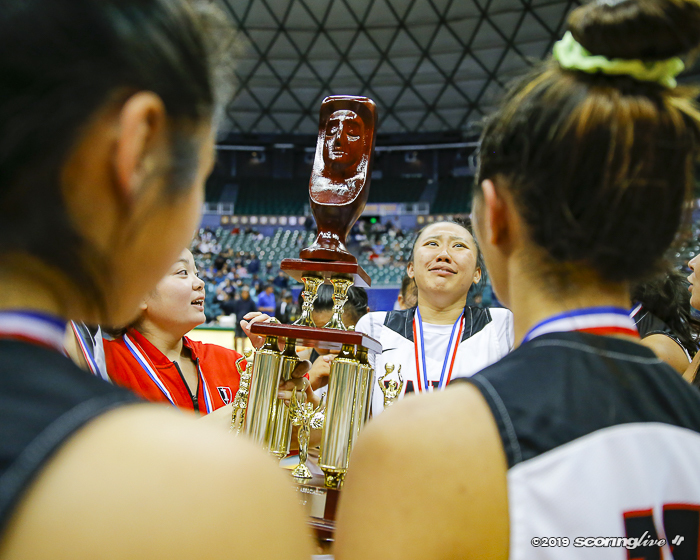 "I promised them, I told them, this is our year," said Wu, the tournament Most Outstanding Player. 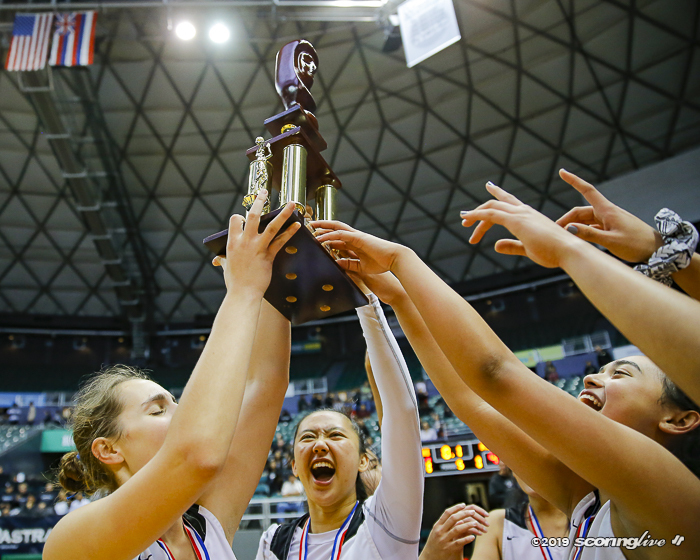 "We can do it. 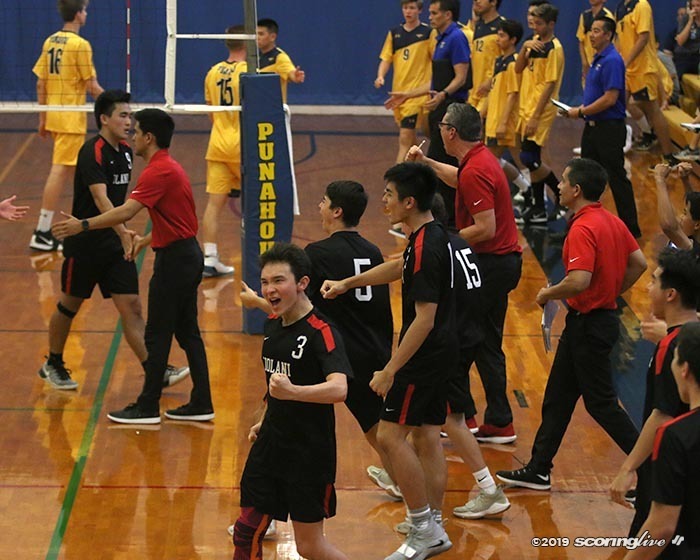 This is the last game of the season, give everything you got. 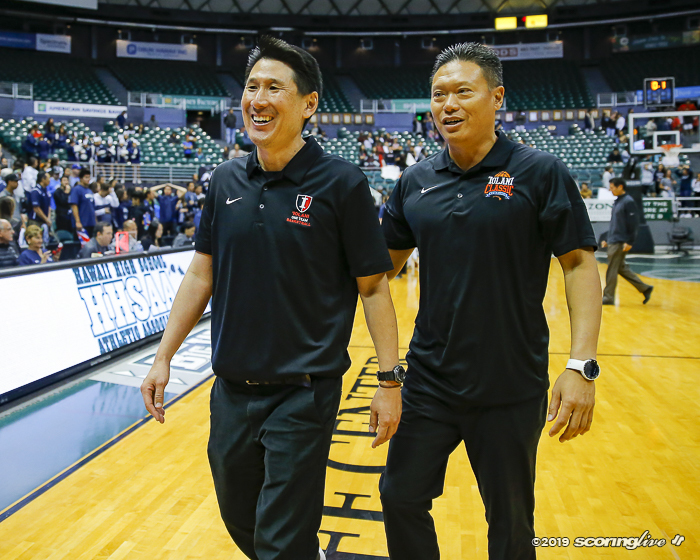 Before the game, I called a meeting. 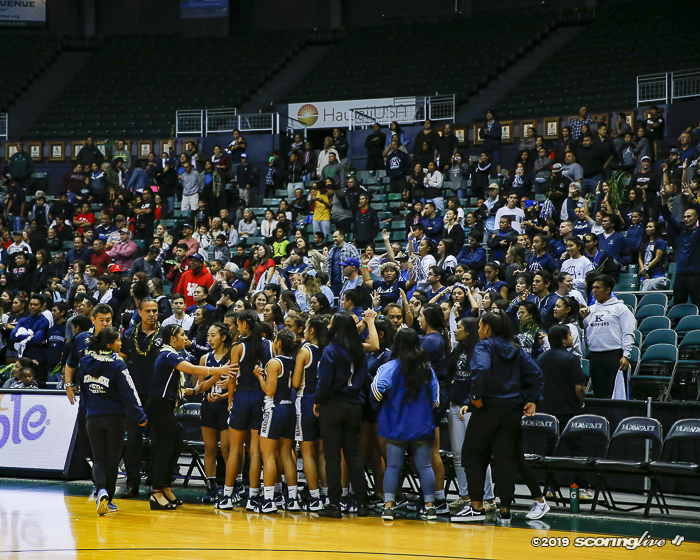 I told them this game right here is going to change history. 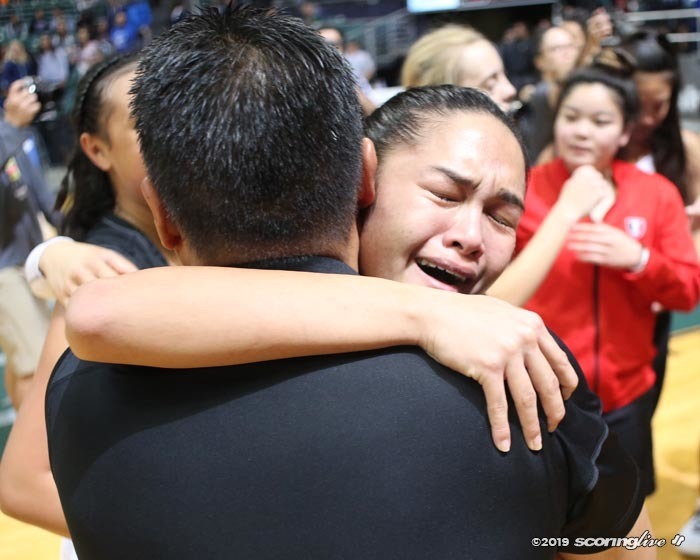 We haven't won states in over 20 years and I told them this is it, guys." 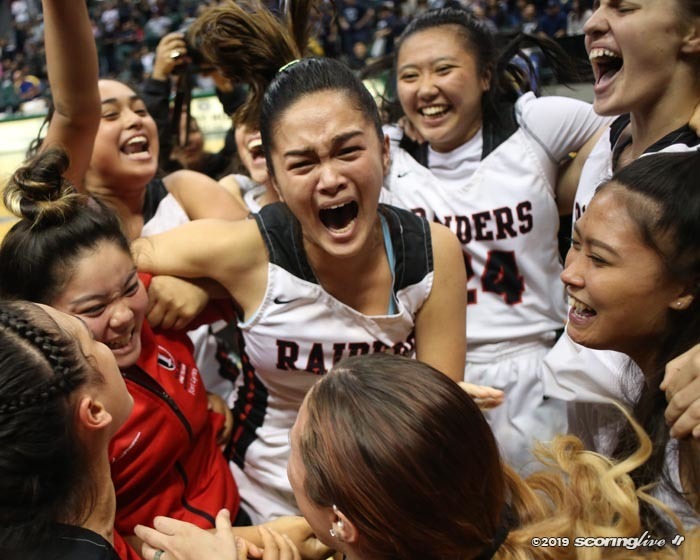 The Raiders indeed made history. 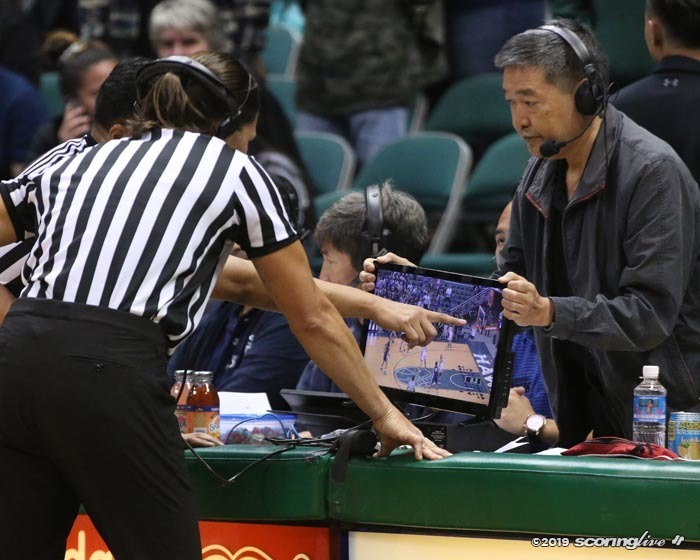 No other final ever ended on a video review.